What is your dream ocean paradise holiday? Mention this and the Maldives will immediately come to mind. Sun, sand, beaches, excellent diving and snorkelling, luxurious water villas – it’s a tropical paradise! But guess what? 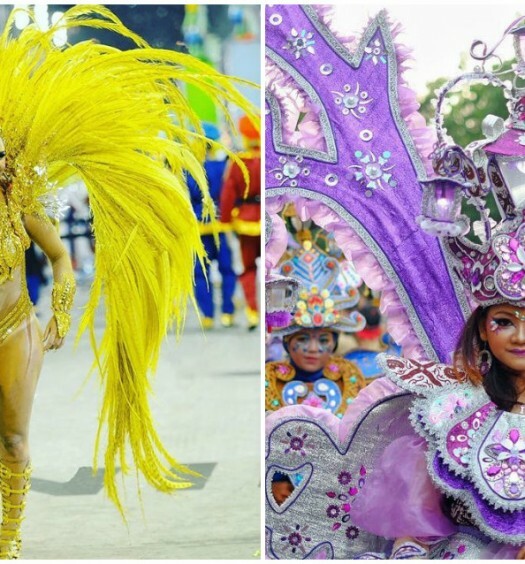 The Maldives don’t hold exclusive rights to all these amazing things. Located in West Papua, the eastern region of Indonesia, Raja Ampat is often called the last paradise on earth and is well-known for its spectacular (and sometimes bizarre) sea creatures and biodiversity, breathtaking islands with beautiful white-sand beaches and crystal blue lagoons, traditional villages with local tribes and unique traditions unlike anywhere else in Indonesia. 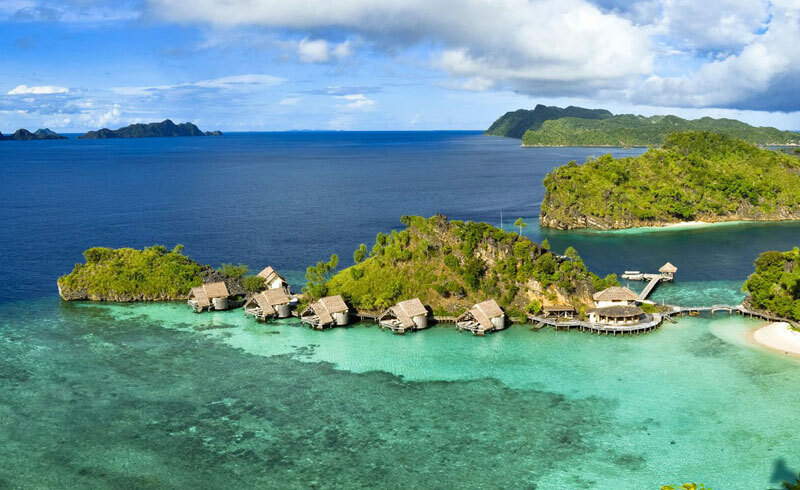 In short, Raja Ampat is more than just another fancy tropical paradise with luxurious water bungalows (though you can find them too). 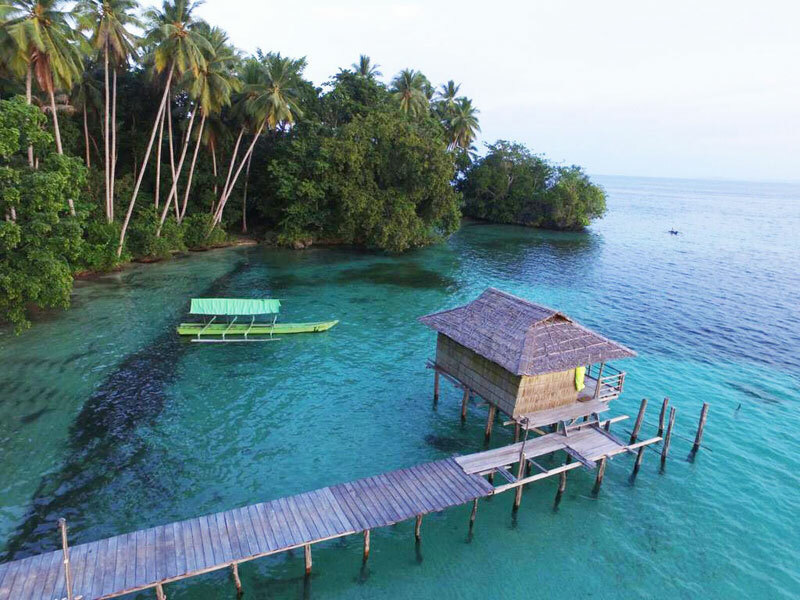 This territory dominated by four main islands (Raja Ampat = Four Kings), namely Waigeo, Salawati, Misool and Batanta and a network of thousands of islands, is even better than the Maldives in every single way. 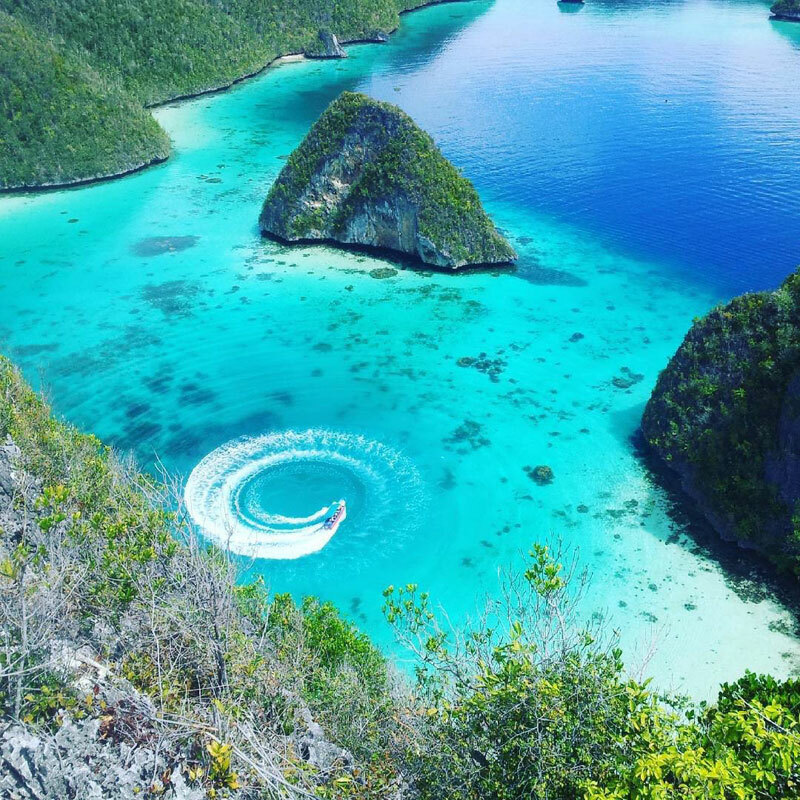 After spending a few days in Raja Ampat, don’t be surprised if you wonder if you are already in heaven! Take Lion Air to Soekarno Hatta International Airport, Jakarta/CGK. Return flights from USD 141 (approximately SGD 200). From Jakarta, take Batik Air to Domine Eduard Osok Airport, Sorong/SOQ. Return flights from USD 151 (approximately SGD 214). From Sorong, take Wings Air to Marinda Raja Ampat Airport, Waisai /RJM. Return flights from USD 44 (approximately SGD 63). 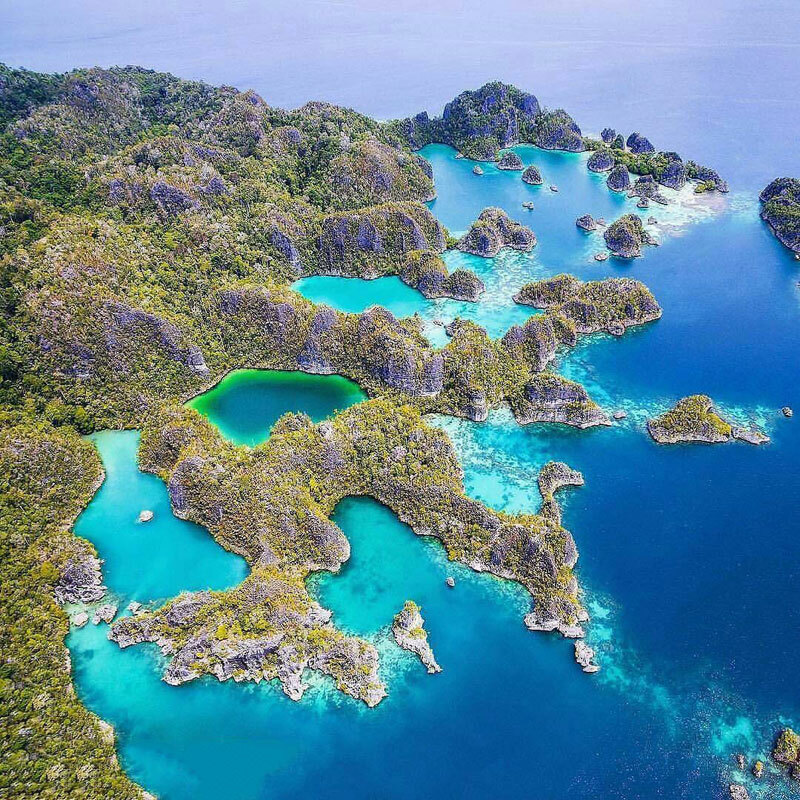 The best time to visit Raja Ampat is during the dry October-May period, which is actually the rainiest period in western and central Indonesia. Despite the dry season, because of its tropical climate, you may still encounter unexpected rainfall, though this will be much less frequent than during the rainy season. 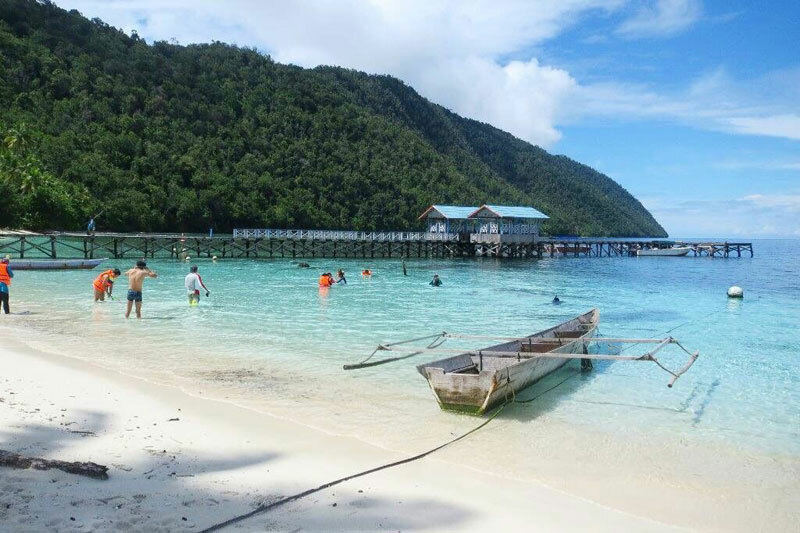 The simplest way to get to your accommodation from the airport in Waisai (the capital of Raja Ampat) is to arrange for a pickup with the accommodation you booked. Transfer prices vary according to distance between Waisai and your homestay or resorts. If you prefer to arrange your own transport, your options are via Transwisata in Waisai (ask a transport operator at the port to take you there). 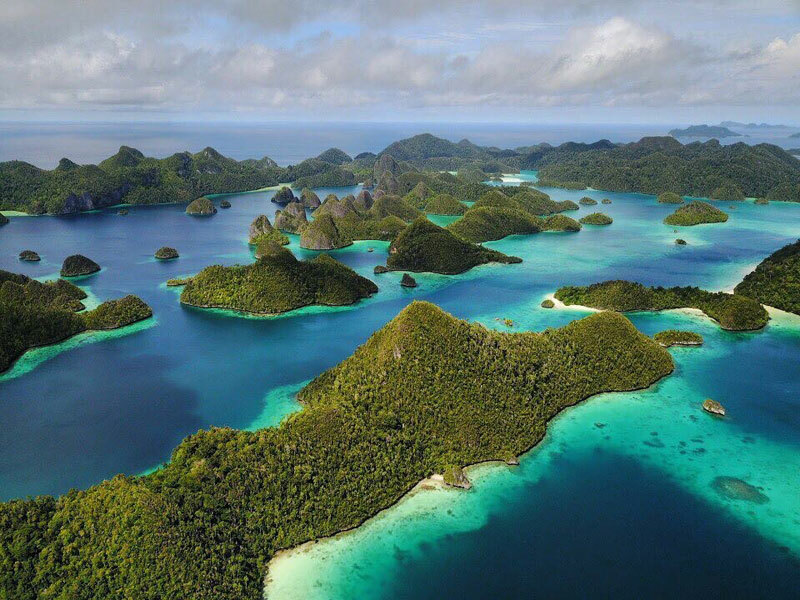 Note: As Raja Ampat is a conservation area, all visitors will have to buy Raja Ampat Marine Park Entry Permit for Rp.1,000,000 (USD 75) per person per calendar year. It works like a travel visa, so if you’re planning to visit Raja Ampat again within a year, the same permit will still be valid. 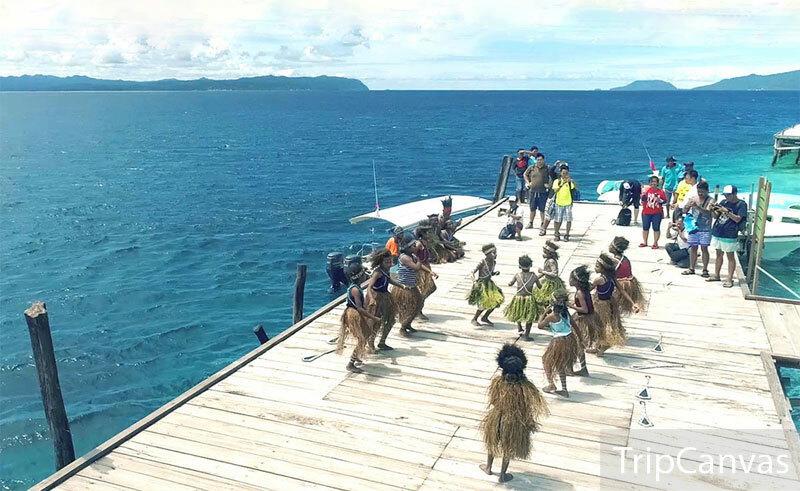 To buy the permit, you can visit the Tourism Information Centre in Sorong, the Waisai Port Office Ticket Booth, or the UPTD KKPD Office in Waisai. From Jakarta, take Batik Air to Domine Eduard Osok Airport, Sorong/SOQ. Return flights from USD 277 (approximately MYR 1,009). From Sorong, take Wings Air to Marinda Raja Ampat Airport, Waisai /RJM. Return flights from USD 44 (approximately MYR 195). From Sydney, take Jetstar to Ngurah Rai International Airport, Bali/DPS. Return flights from USD 337 (approximately AUD 446). From Bali, take Lion Air to Sultan Hasanuddin Airport, Makassar/UPG. Return flights from USD 99 (approximately AUD 131). From Makassar, take Batik Air to Domine Eduard Osok Airport, Sorong/SOQ. Return flights from USD 152 (approximately AUD 201). From Sorong, take Wings Air to Marinda Raja Ampat Airport, Waisai /RJM. Return flights from USD 44 (approximately AUD 58). Take Batik Air to Domine Eduard Osok Airport, Sorong/SOQ. Return flights from USD 277 – approximately SGD 392. Take Wings Air to Marinda Raja Ampat Airport, Waisai /RJM. Return flights from USD 44 – approximately SGD 63. 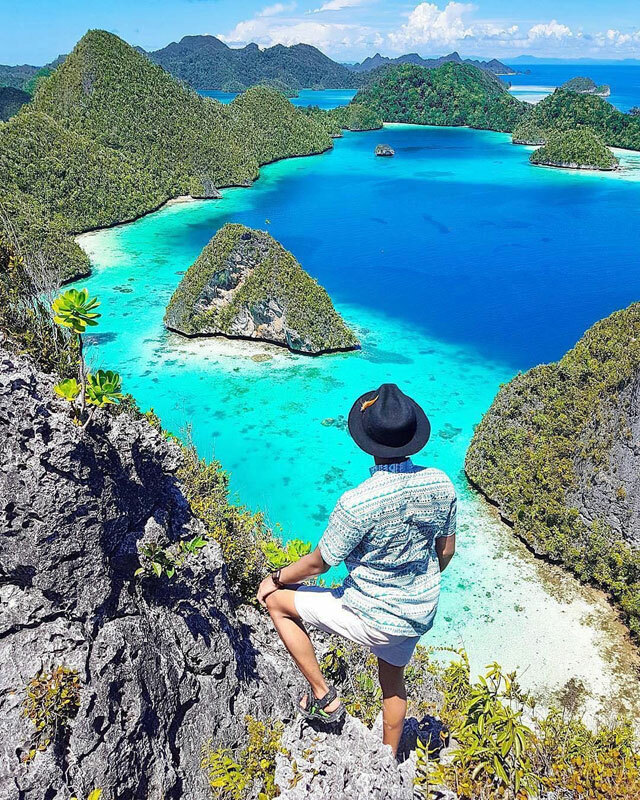 The tropical islands of Raja Ampat are one of the most sought-after destinations for travellers—be it adventure seekers looking for scuba diving courses, honeymoon couples who would rather lounge in secluded beaches or nature lovers who want to get a slice of paradise. And if you are still thinking about the Maldives, here’s 12 reasons why Raja Ampat is so much better! Check our experience here too! 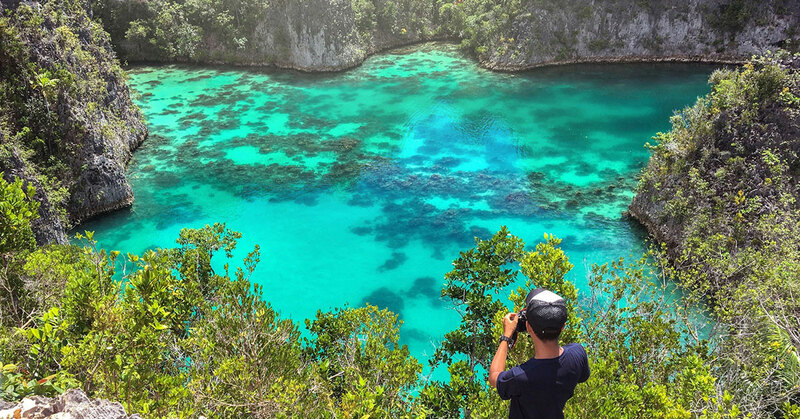 You might have been to Bali, but have you heard of the stunningly beautiful island of Misool in Raja Ampat? Surrounded by enormous limestone rock formations, the scenery of Misool Island is very pleasant, but due to its sculpted geography, it doesn’t have as many beaches as other islands in Raja Ampat. Yet, Misool features many spectacular nature attractions, and these are only a few. Tired of the usual snorkelling or diving experience? 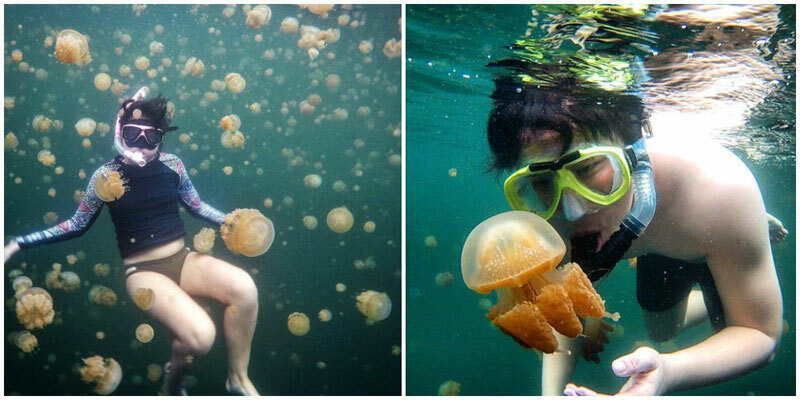 How about swimming with thousands of jellyfish? 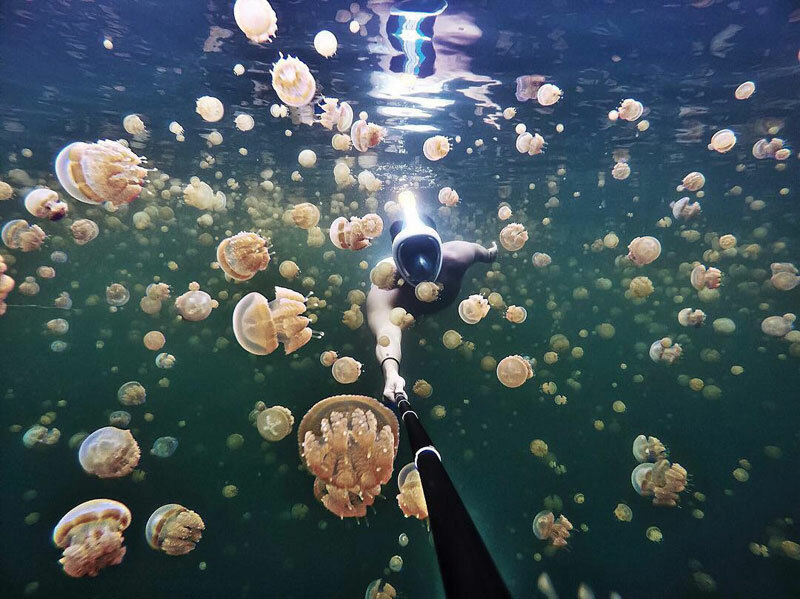 Another plus point – these are stingless jellyfish, so here in Lake Lenmakana, nature gives you a chance to get all tangled up without being stung. 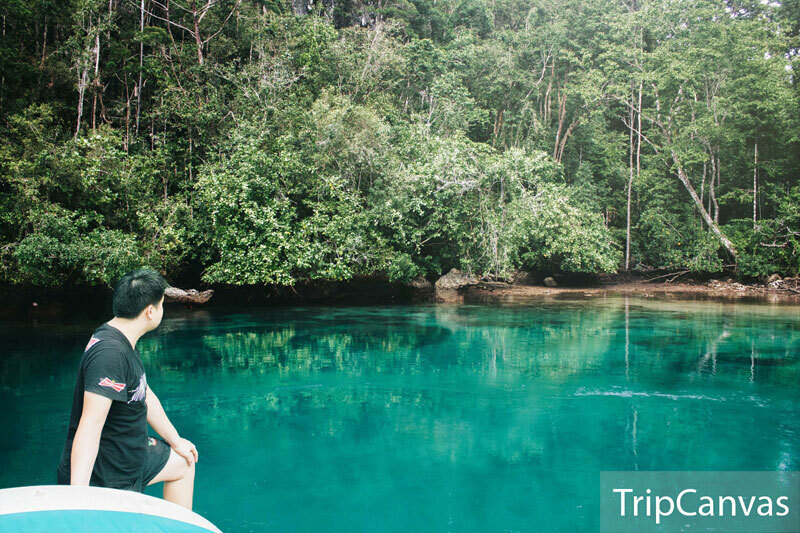 You’ve probably heard about the jellyfish lake in Palau island or Kakaban island in East Kalimantan. 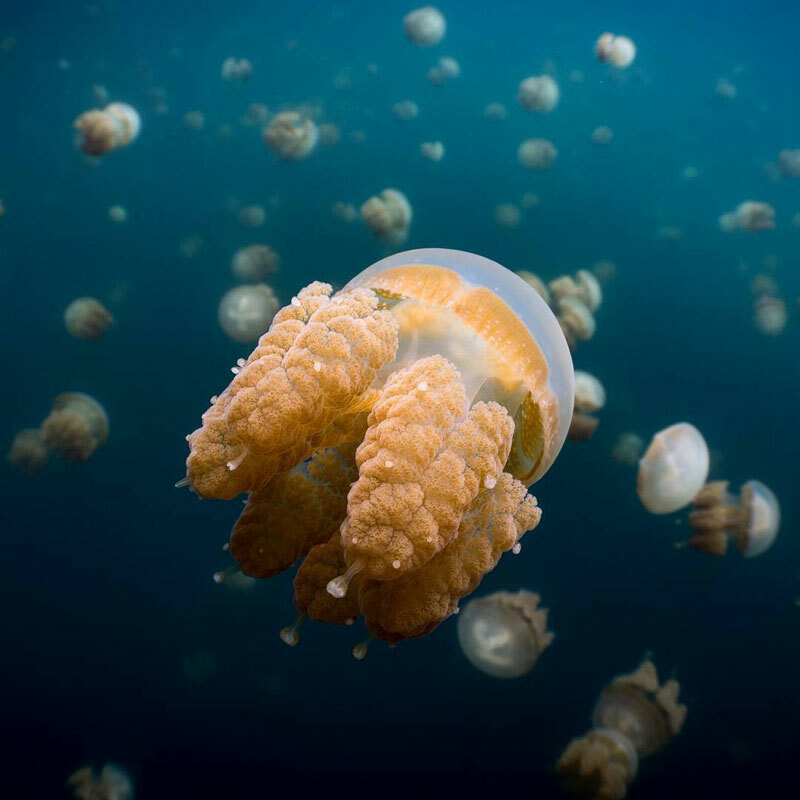 Lenmakana’s jellyfish lake is said to have just been discovered few years ago. 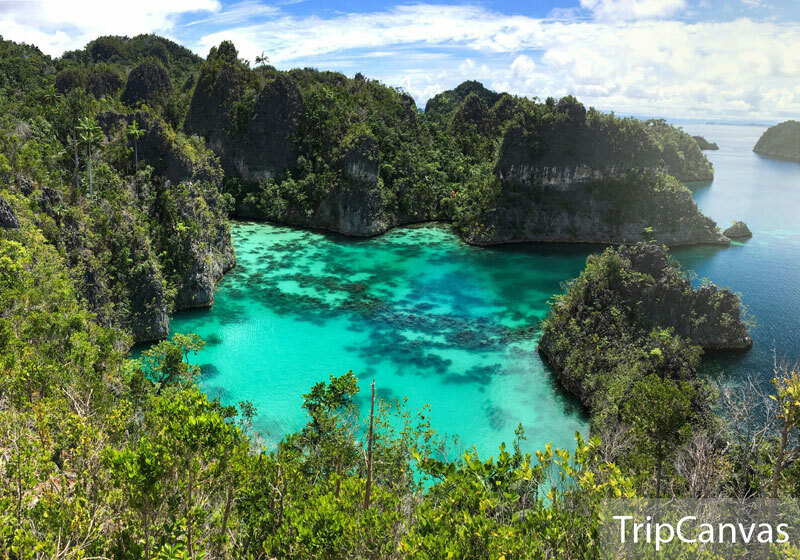 Like many places in Raja Ampat, you need a moderate fitness and climbing ability to get here. The location is quite remote, so only the locals can guide you there. 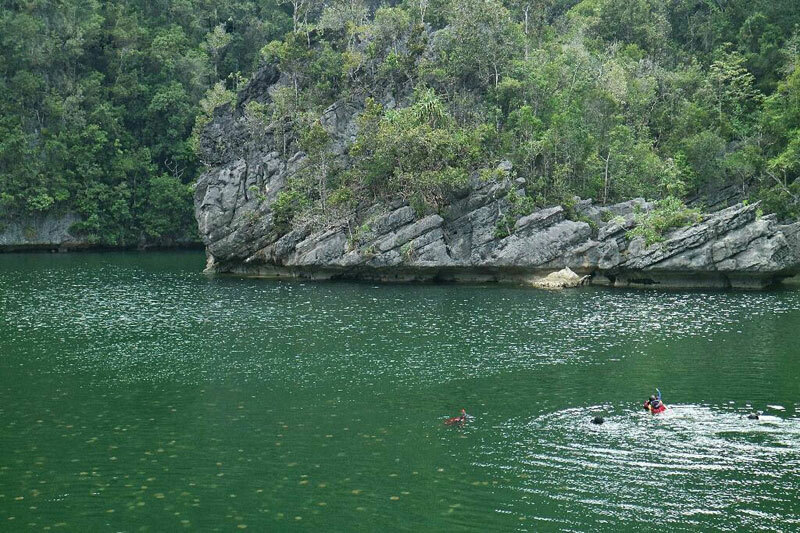 You need to approach the karst by a speedboat and climb the steep reef. A glove is highly recommended. Tip: The best time to visit is just after 1pm when the lake is glowing with thousands of golden jellyfish floating near the surface. 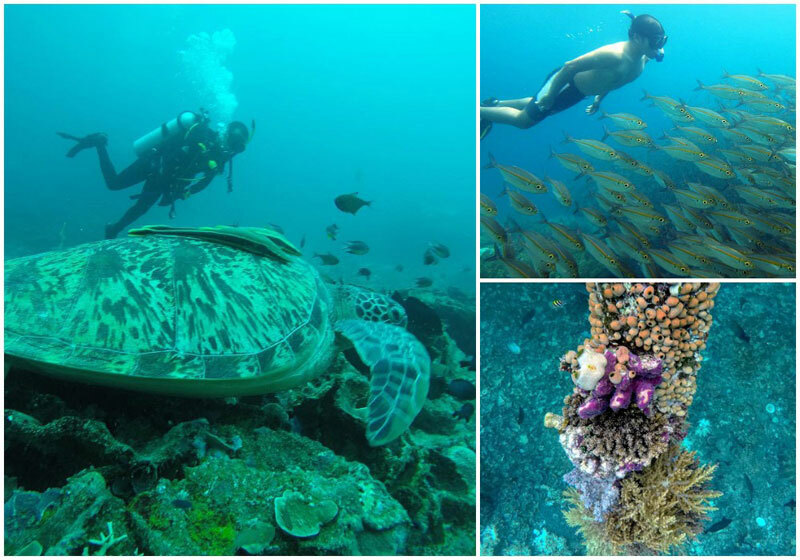 Swimming with them is definitely once-in-a-lifetime experience! Location: Misool Island, Raja Ampat, West Papua, Indonesia. Coordinates here. 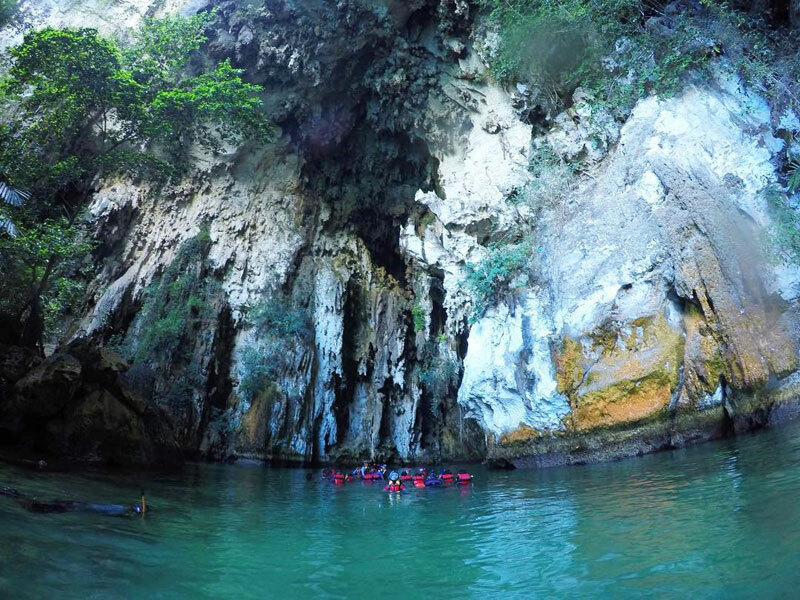 It is named Goa Keramat or Sacred Cave because this huge cave (approximately a few hundred metres long) is believed to be situated at the centre of the ancient kingdom of Misool. Entering this cave is quite challenging, because the water is cold and it’s pretty dark inside. So don’t forget to bring your underwater torch! 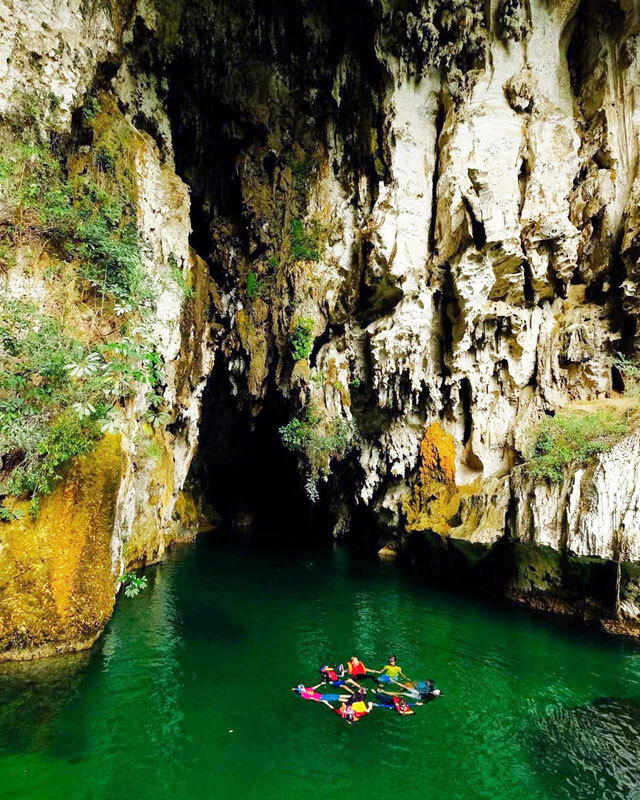 All the efforts will pay off – the views inside are spectacular, with magnificent formations of stalagmites, stalactites, and rocks. There are almost no other creatures in the cave except for bats. Small fish are seen only in the area near its exit. 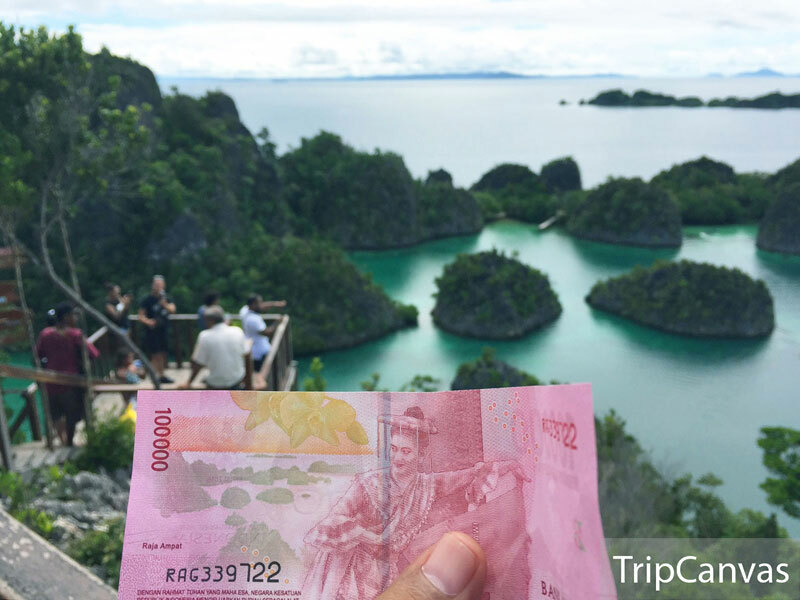 If you happen to have the new Indonesian Rupiah IDR 100,000 banknotes, you’ll be familiar with this spectacular view. Yup, that’s a picture of Piaynemo on the note! 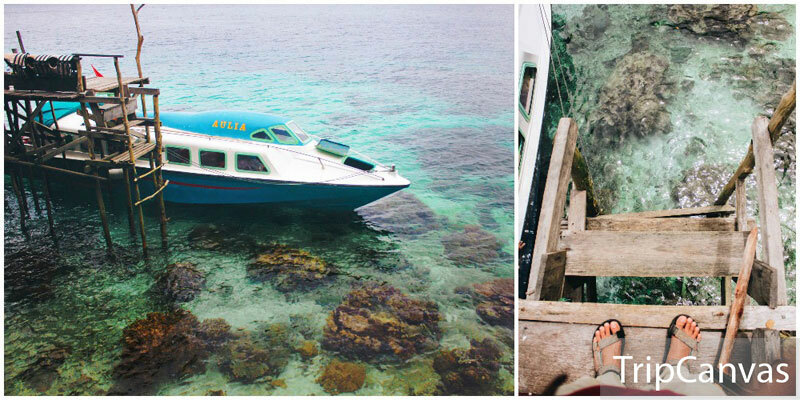 Every bit of Raja Ampat is amazing but Piaynemo is a bit more dazzling than everything else. To truly appreciate its beauty, you need to climb up to a vantage point where you can get an amazing view. Climb up the long flight of stairs (don’t worry, there’s handrails on both sides) up to the viewpoint – it’s about 320 steps. Thankfully, there are rest stations after about 100 and 200 steps! And once up there, the view is simply surreal, with different shades of blue and turquoise, and a stunning view of the myriad karst islands. Just don’t forget to bring along water and sunscreen. 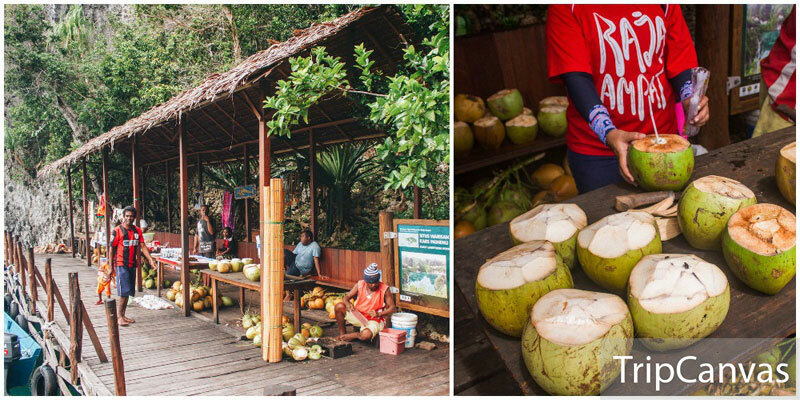 Relax on the way down and enjoy some refreshing coconut water sold on the jetty. 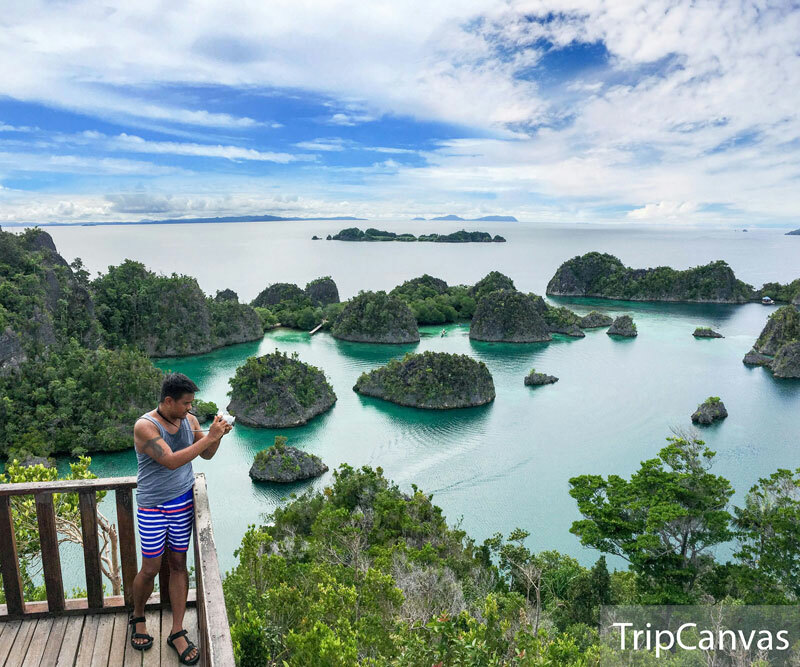 Location: Groot Fam, Saukabu, Raja Ampat Islands, Raja Ampat Regency, West Papua, Indonesia. Coordinate here. To see this spectacular scenery, you must climb an approximately 30-metre-high coral hill that’s lined with neither stairs nor path, but only sharp rocks. So you need to be very careful as you hike up. But no worries, with proper footwear (no sandals or flipflops) and care, everyone can do it! Once you reach the top of this rocky hill, you’ll be greeted with the spectacular view of the star-shaped blue lagoon. Simply spend some time to enjoy the breathtaking view surrounded by green coral islands and clear blue sky, feel the wind in your hair, and take some great photos. Trust us, it’s totally worth it! Have you seen this incredibly picturesque island in pictures? The inhabited island of Wayag is a well-known icon of Raja Ampat. With breathtaking views at every turn, in Wayag, you will find pristine beaches and the iconic karst islands scattered beautifully across the crystal blue ocean. 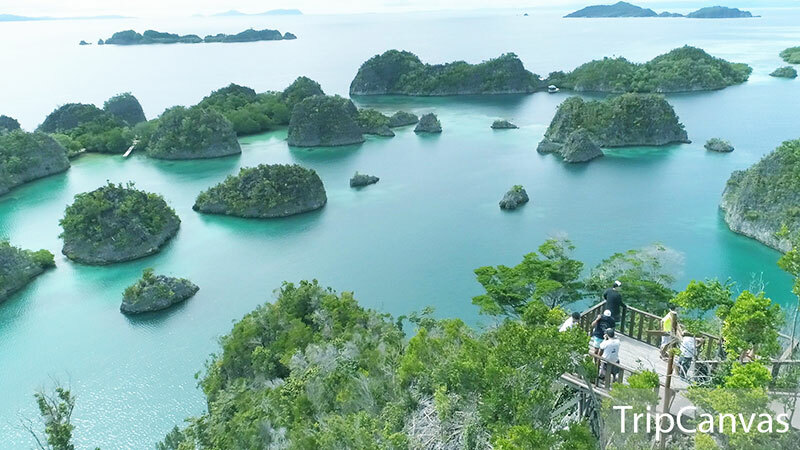 To see all the mesmerising cone-shaped islands, be sure to climb up to the top of Pindito Hill for an amazing view. 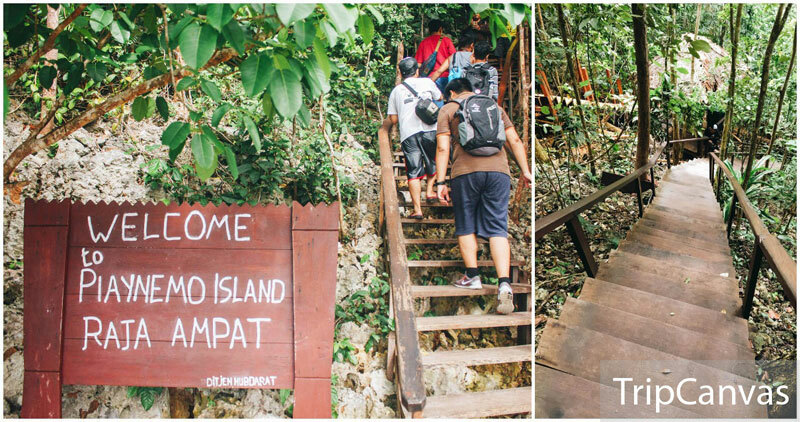 But note that it’s a quite steep and difficult 30-minute hike uphill – definitely not for the faint-hearted! Do prepare suitable equipment such as hiking shoes, gloves and thick pants because you are hiking up a sharp coral stone hill. Don’t forget to bring enough drinking water, food, and extra clothes. 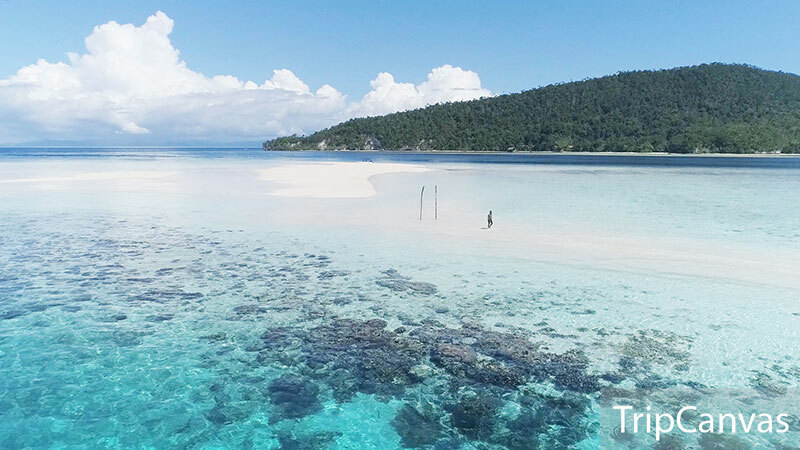 If trekking and climbing is not your thing, you can always enjoy the white sand beaches and crystal clear waters around the islands while snorkelling or diving! How to get there: Lying northwest of Waigeo, Wayag is a round trip of over 300km from Waisai. There’s no homestay or accommodation in Wayag. So if you want to visit you’ll be up for a long day trip from your accommodation. Arborek is a tourist village with white sandy beach and beautiful pristine blue sea. There are many affordable homestay options and a local dive shop to assist with diving and day trips. You can even bring some local handicrafts here (nearly all mothers in this village make handicrafts for a living). Here, you can see how the mamas weave hats and bags while carrying their babies. 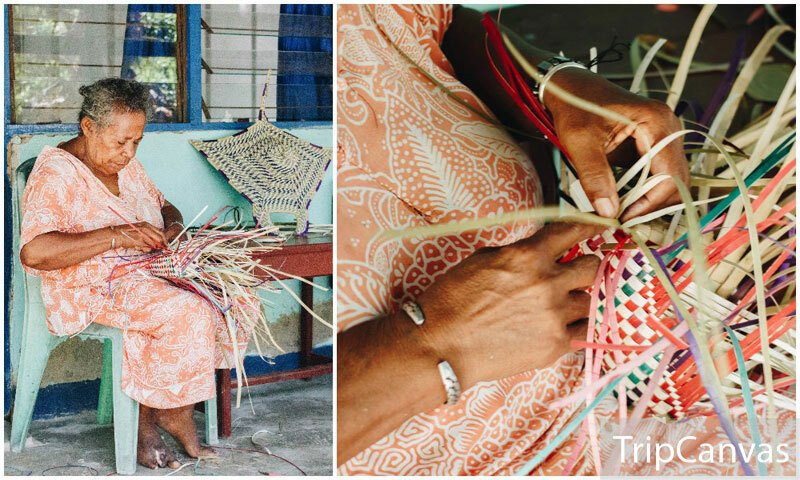 If you’re interested to learn, don’t hesitate to ask them to teach you how to weave. You’re learning a new hobby to bring home! You can also watch groups of seabirds playing on the beach – they are part of the stunning scenery of Arborek Village. How to get there: From Waisai, you can continue your journey (less than two hours) by using a rented longboat. The longboat can be arranged via homestay or the local dive shop. Arborek is 15 minutes from Waisai by boat. Coordinates here. 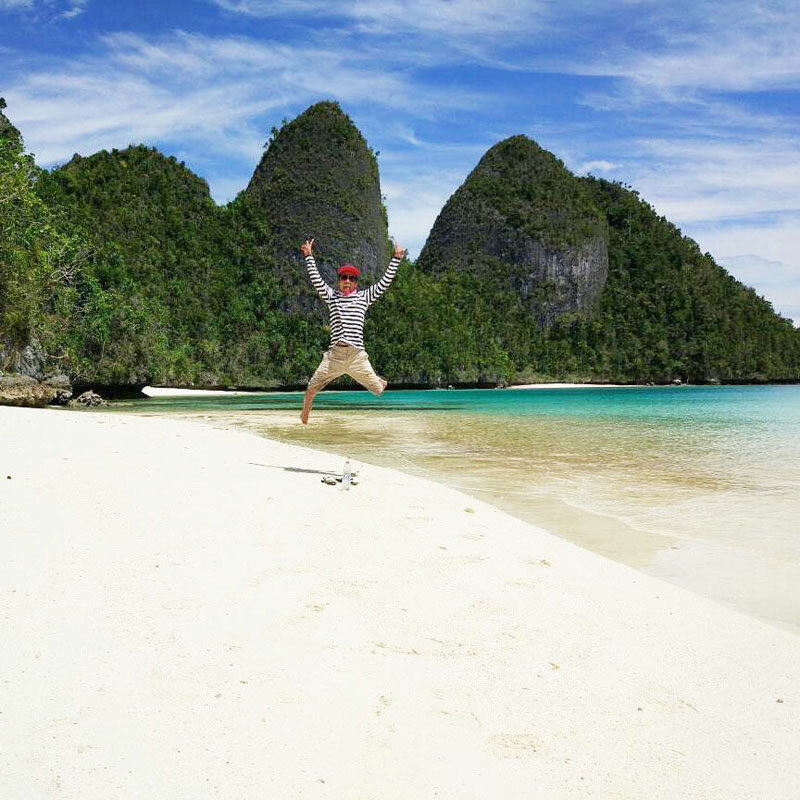 500 islands in Raja Ampat. It is not well known yet, though Prince Albert of Monaco fell for its charms many years ago. 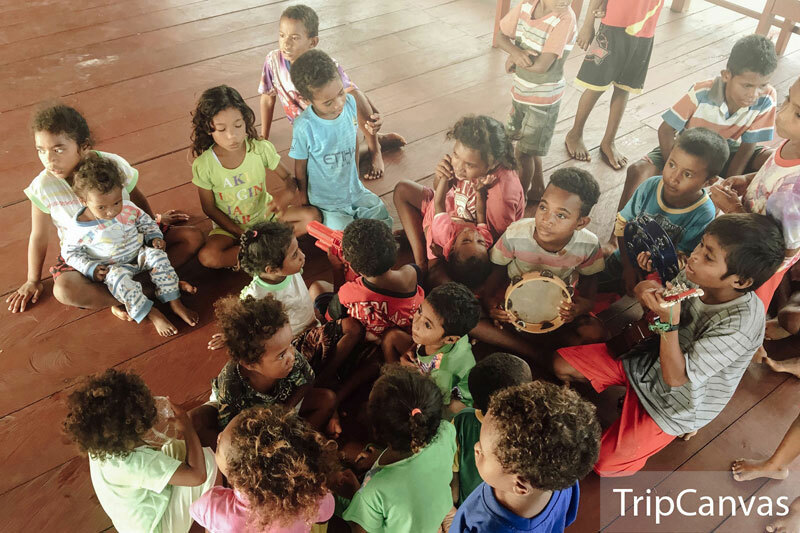 Here, you’ll find the nicest and friendliest children who live an idyllic lifestyle on and in the water – and that’s what we love about this village. 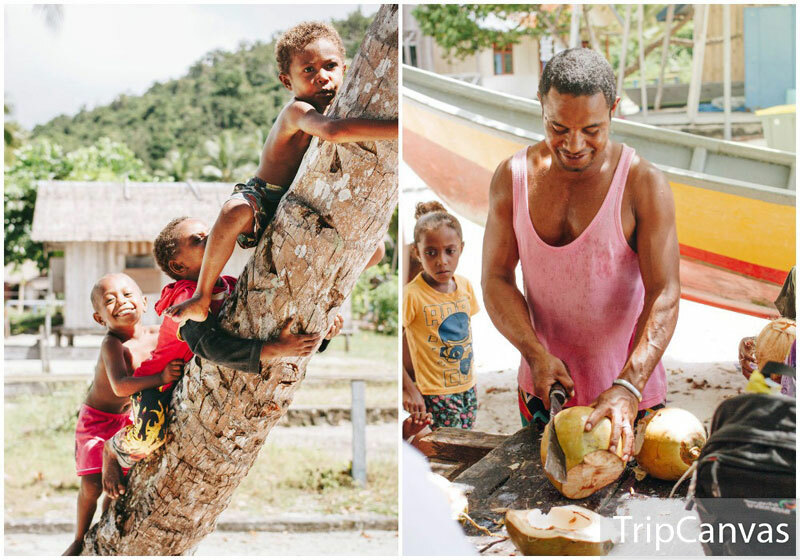 When you visit this fishermen’s village, you’ll feel the hospitality of the locals as you interact with them. Maybe they’ll even sing and dance for you! 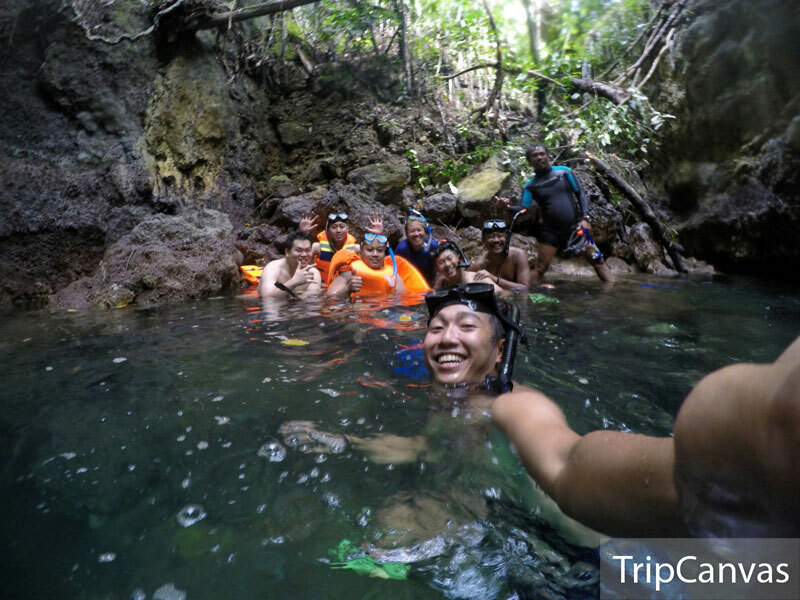 You can also feed the fish, trek in the mangrove forest or snorkel around the island to explore the beautiful underwater life. 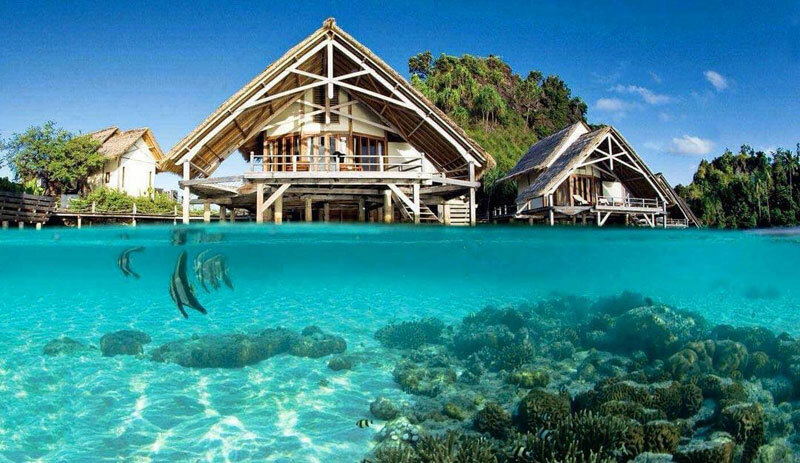 Location: District MeosMansar, Raja Ampat Islands, West Papua, Indonesia. Coordinate here. 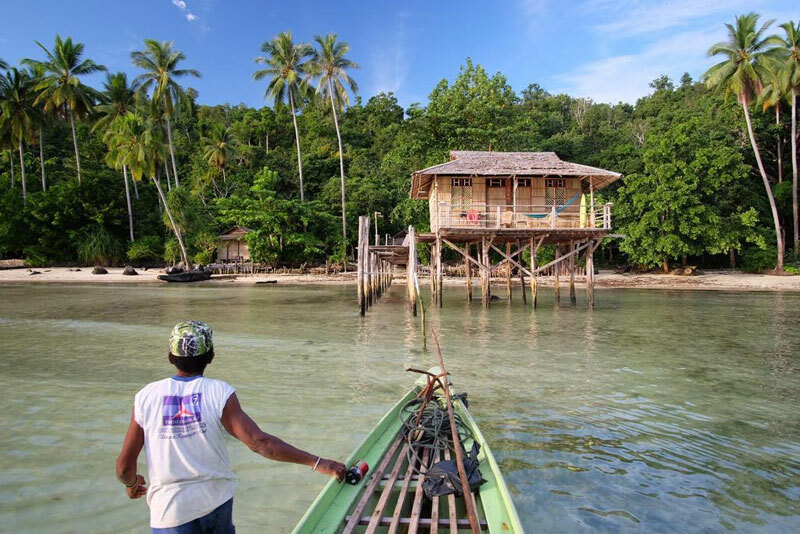 Sauwandarek village is a remote, quaint, and quiet little island village in Raja Ampat off the west coast of Papua. With its own school and church, its people live isolated from the outside world, and they are happily so. 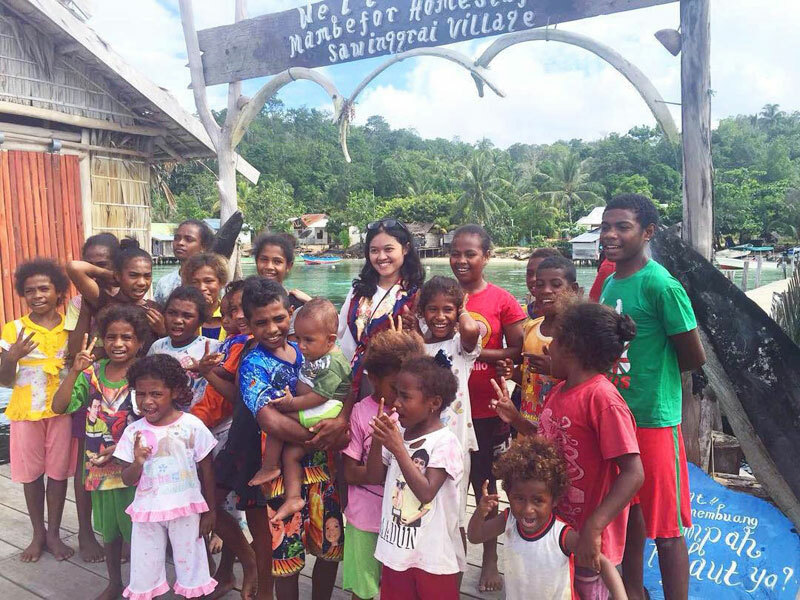 The villagers take great pride in this clean island and the surrounding waters. Have we mentioned that they are also friendly? You’ll love striking up a conversation with them! The island is very small as you can walk around the island within 15 to 20 mins. The marine life around the jetty and around the island reef is spectacular. 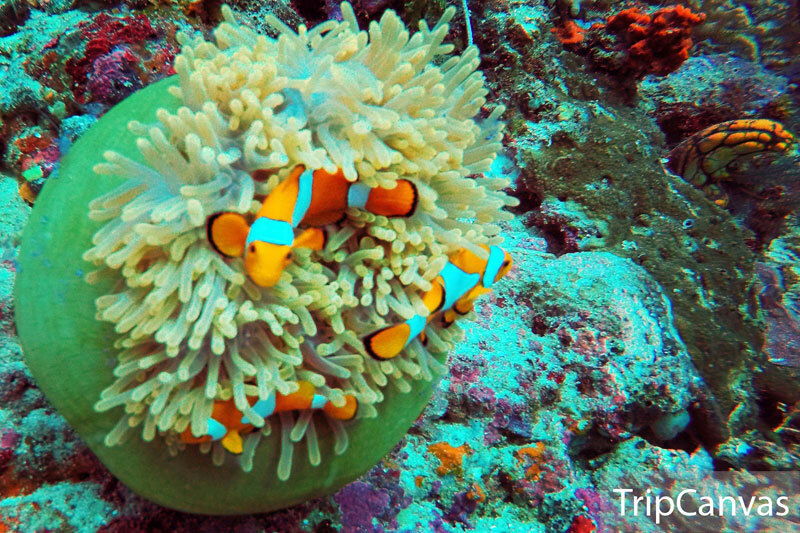 Huge schools of fish, corals, sharks, macro species – definitely a must see! Even around the jetty, you will be able to find around 6 giant clams (about one metre wide). It would be difficult to miss them as they are HUGE. There are no fixed attractions on the island but it’s a beautiful place to spend a few days, relaxing and with stunning views and peaceful atmosphere. In the middle of nowhere, there lies a lone circular island hidden to many. Only for a few hours a day, when the tide is low, this little island rises out of the ocean. This is why they call it Pasir Timbul or “arising sand”. Step down from the boat and feel your own universe. It is so beautiful and calm. The combination of smooth white sand and water carrying hues of aquamarine, turquoise, and midnight blue is spectacular. The strange thing is, this tiny sand island doesn’t get washed out by the daily tides. If you come at the right moment, you can even take a picture as though you are floating or walking on water. Location: District Mansuar, Waigeo, Raja Ampat, West Papua, Indonesia. Coordinates here. 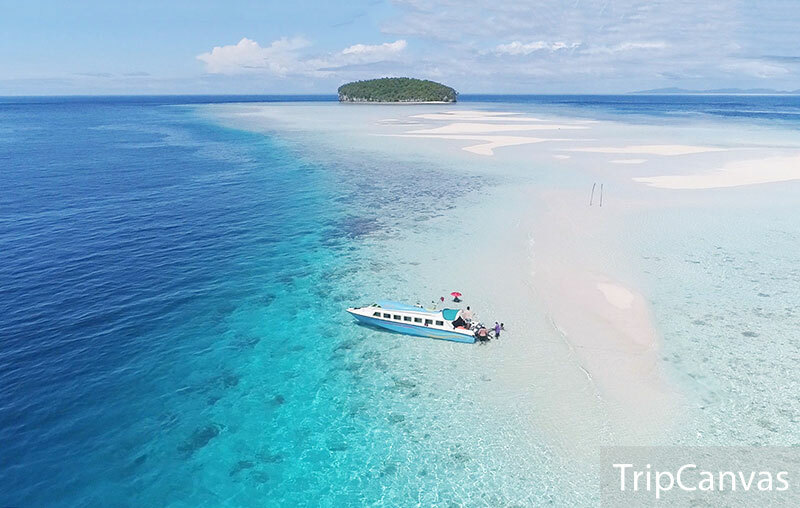 How to get there: The easiest way to reach here is by booking a boat from Arborek Village or Waisai, the capital of Raja Ampat. 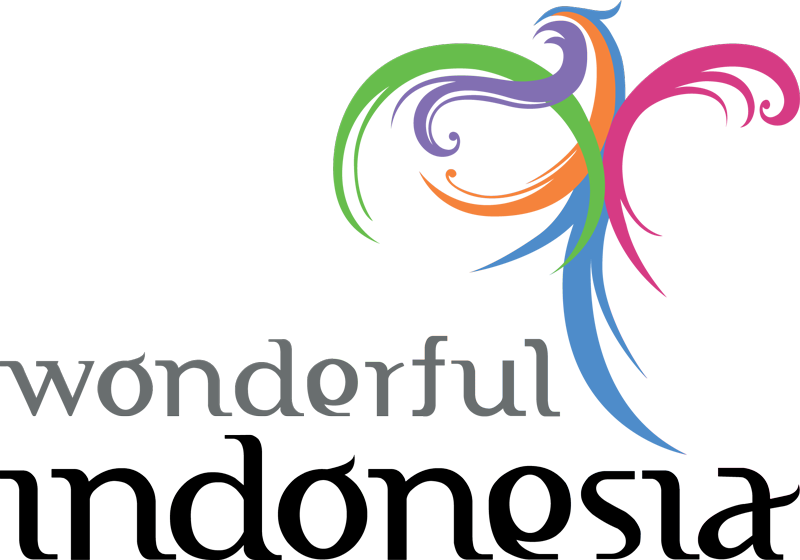 You can ask your resort or guesthouse to book it for you. Due to the water level, the boats can’t come too close to the shores of sand island. From the point where the boat stops, you need to swim or walk there. Not just mie goreng and nasi goreng served – in most homestays or resorts, you’ll find a distinct food tradition shaped by this fascinating region’s maritime geography and variety of seafaring and land-based cultures. The historical reliance on sago, cassava, and taro roots as Papua’s starchy staples is still plain to see, though the rice introduced by the Javanese and others now predominates. Papeda, made from sago flour base, is a very popular staple food in coastal communities. To make this unique food is relatively easy, simply by pouring hot water into the sago flour, stirring it repeatedly until it has thickened and takes on a glue-like appearance. 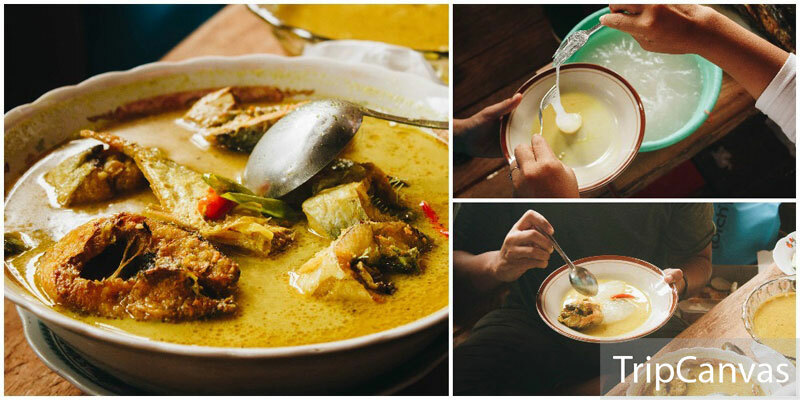 It is usually served with yellow sour-and-spicy fish soup with sambal (chilli) and squeezed lime to add to the flavour. Although lobster is considered an expensive food in many regions in Indonesia, you can easily find it here at a more affordable price. 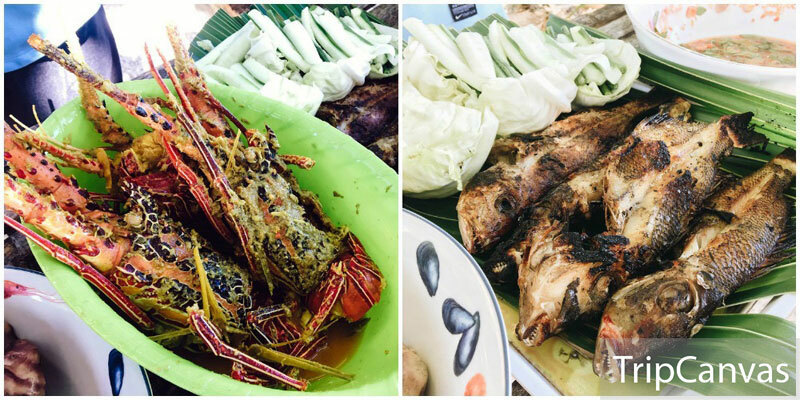 ‘Ikan Bakar’ (grilled fish) may not be unique to Raja Ampat, but it’s plucked from the sea and grilled to smoky, sweet-fleshed perfection over coconut coals – it’s especially good here. 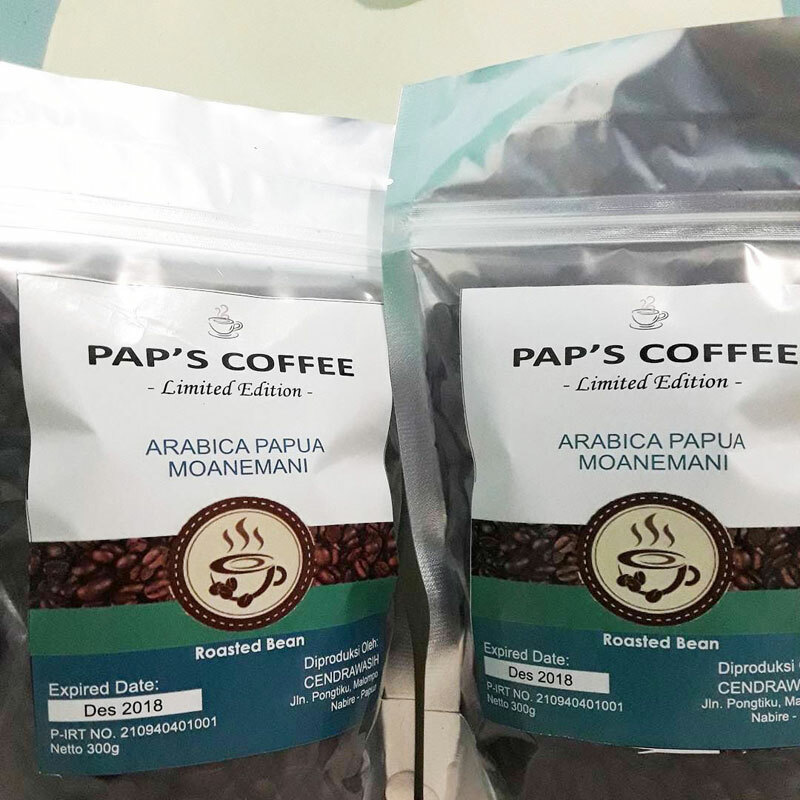 And lastly, for those who love a cup of coffee with a mild flavour and soft, deliciously pungent aroma, the famous Papuan Coffee is definitely a must-try! 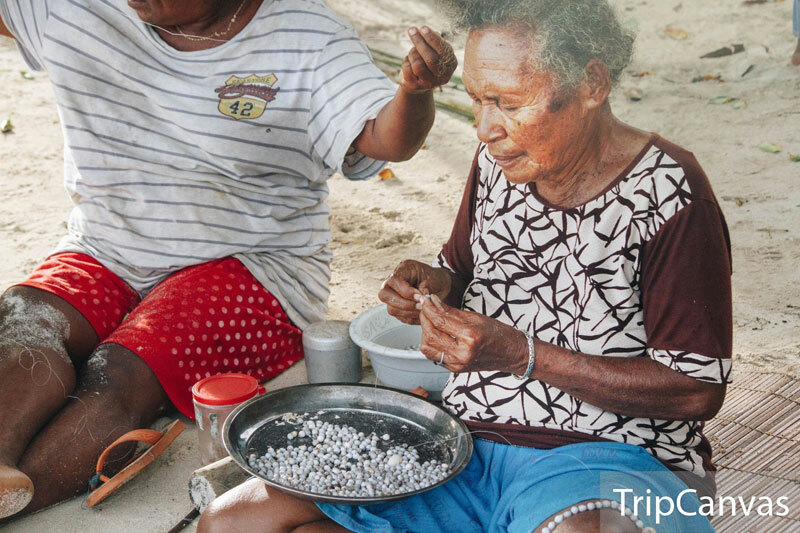 Editor’s Note: The residents of Papua generally do not cultivate their own fruit, so (surprisingly for many) fresh tropical fruit (except banana) are not widely available. 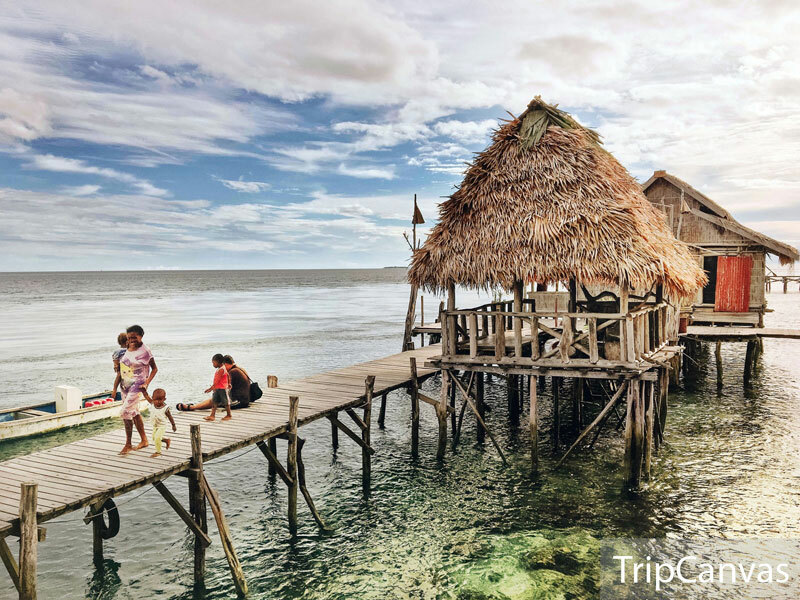 With pristine rainforests atop dramatic limestone cliffs, uninhabited bays with white sand beaches and all sorts of hidden treasures to greet the intrepid explorer, you’ll discover that Raja Ampat is more than just its undeniably famed underwater charm. 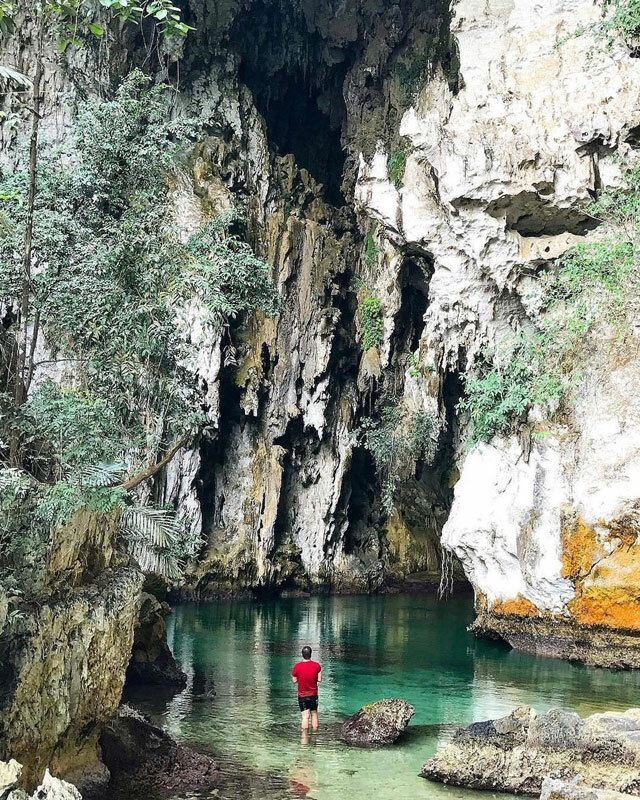 And with an intricate coastline with caves, bays, gorges, hidden rivers, all buzzing with exotic tropical wildlife, you’ll uncover a whole new world beyond how you imagine the islands to be. 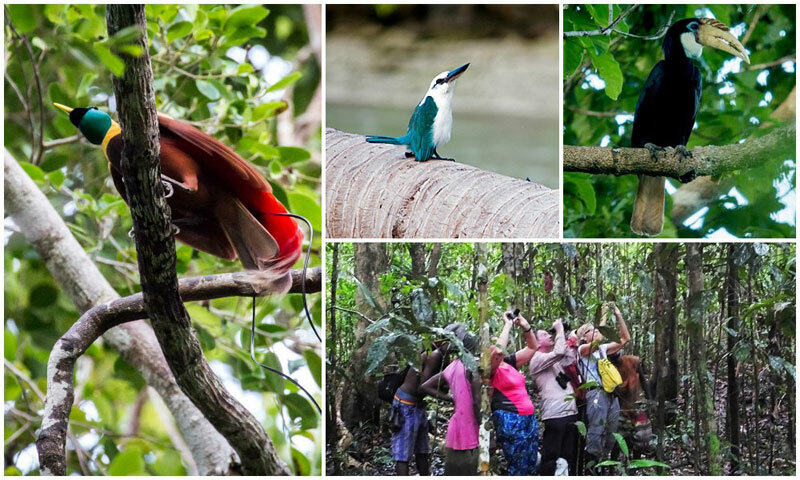 It is home to these colourful exotic birds (more than 200 species!) that can be found anywhere in the nature or surrounding your accommodation – a sight that you’ll hardly be able to spot in Maldives for sure. There are several bird species that you have to hunt in Raja Ampat with good eyes, good timing, either at sunrise or sundown. You can find many species of Birds of Paradise, cockatoos, parrots, hornbills, eagles, and endemic Papuan Waigeo Frogmouth, to mention a few. 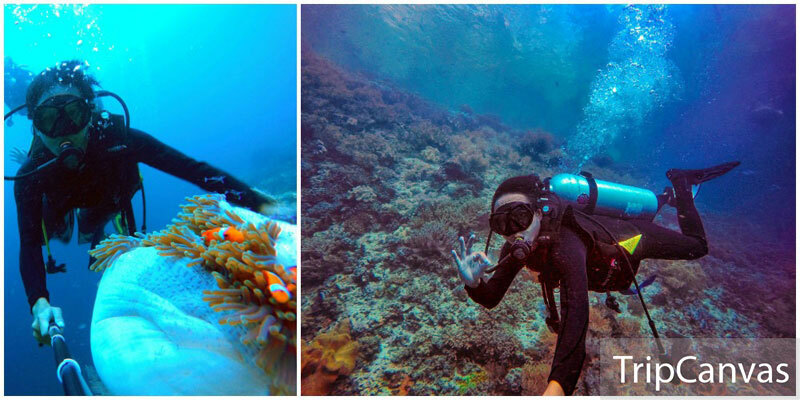 So who says non-swimmers can’t enjoy Raja Ampat? 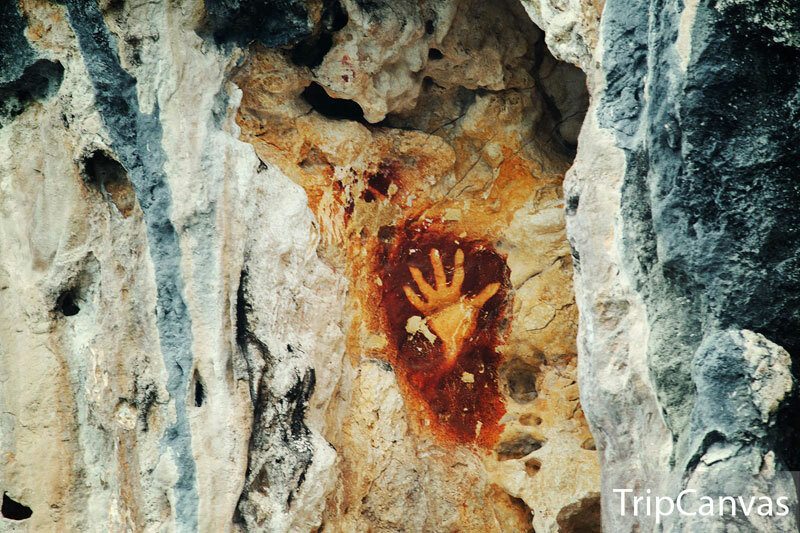 You are now living in the era of cameras and video recorders, but there was once a time when people keep track of history in the form of ancient paintings and handstamps on limestone cliffs. 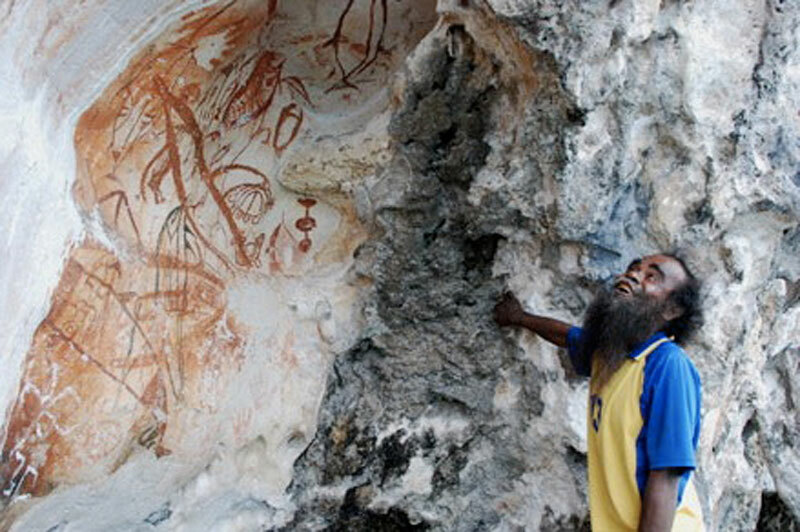 Older than European art and previously thought to be the most ancient (presumably 40,000 – 50,000 years old), the hand-paintings found in Raja Ampat are the first evidences that our human ancestors had been creating art in the region at that time. Till this day, some of these amazing paintings are even as clear as when they were painted. Don’t they make you think of graffiti adorning major urban areas? You can find them in three locations – Pef Island, Sumalelen and Sumbayo Cliff. These paintings are mostly done in reddish colour depicting mostly hand prints, fish, and geometrical paintings on cliffs. 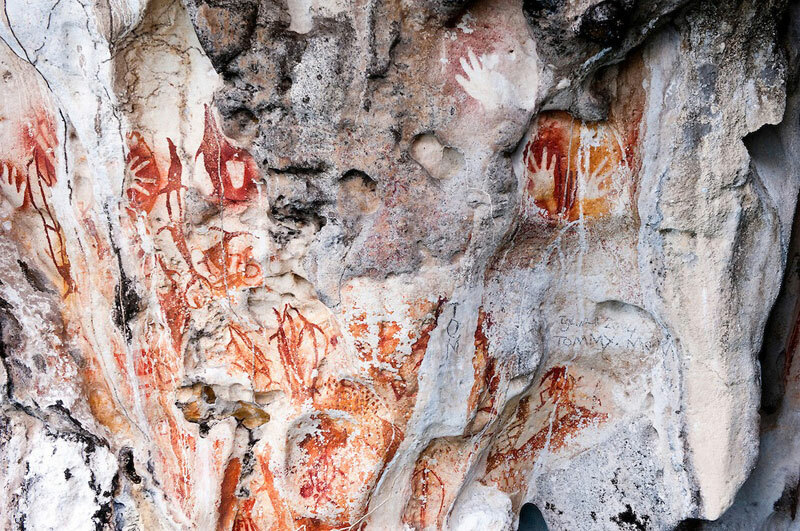 And these hand paintings are similar to many seen halfway across the world, from France to Australia, and their origins are still shrouded in mystery. Location: Kabui Gulf, District Meos Mansar, Raja Ampat, West Papua, Indonesia. Coordinate here. Location: Misool Island, Raja Ampat, West Papua. Coordinate here. 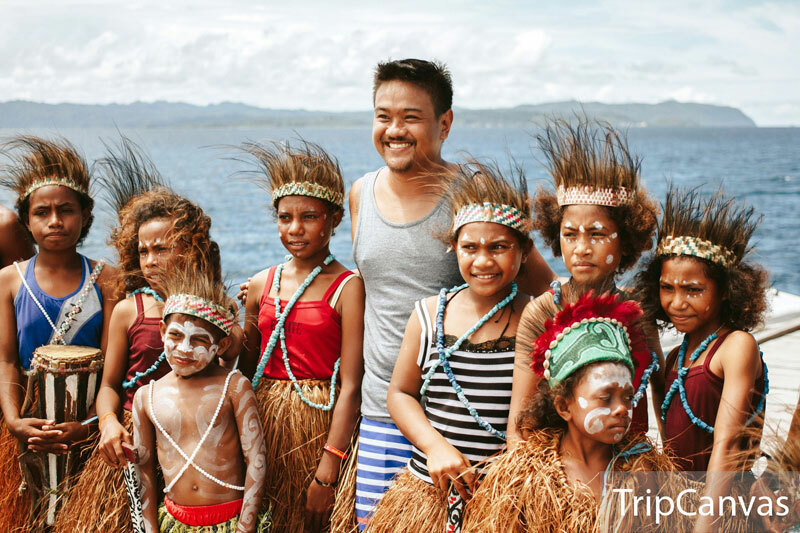 What fun is it for a non-swimmer in Raja Ampat? You’ll only end up watching all your friends splashing into the water, while you sit and sulk, right? Wrong! Even if you can’t swim, you can have just as much fun in the water as a pro swimmer can. 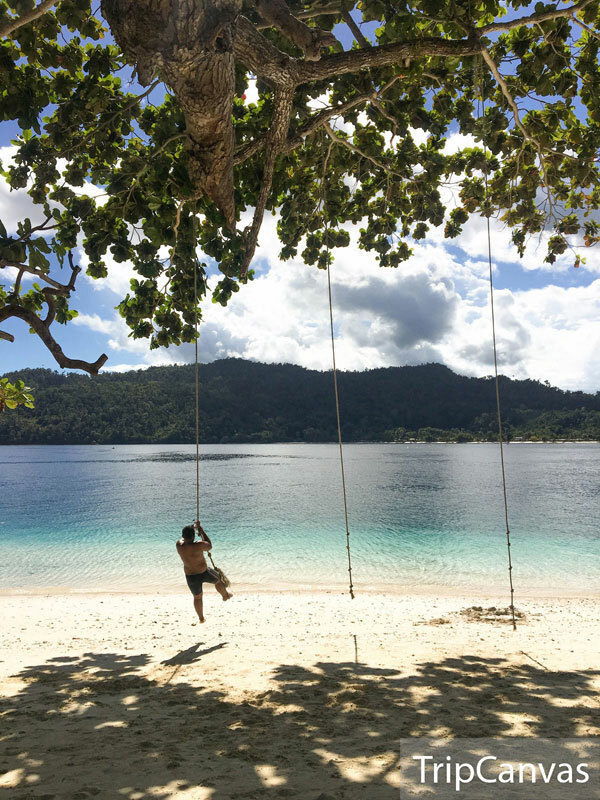 There’s a trove of adventure sports in Raja Ampat that don’t require mastery in swimming, but you need to be brave enough to plunge into the sea with your life jacket on. 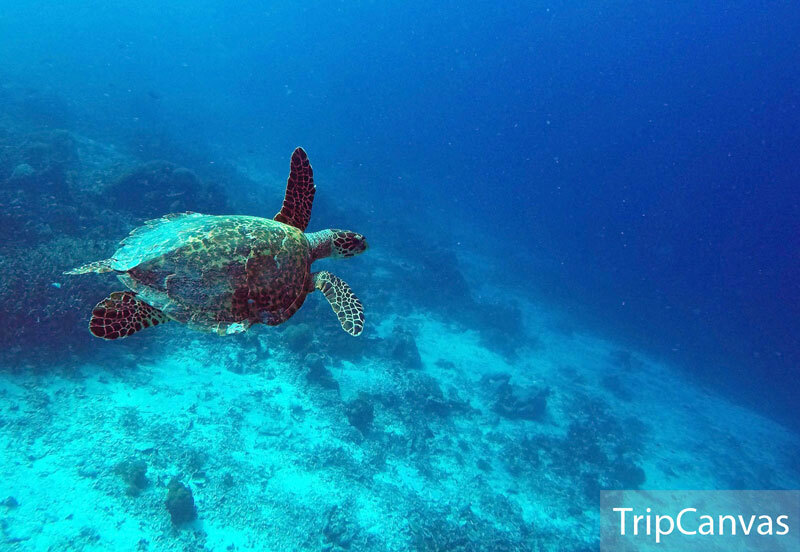 If you haven’t snorkelled before, give it a go and you’ll know what you’ve been missing! 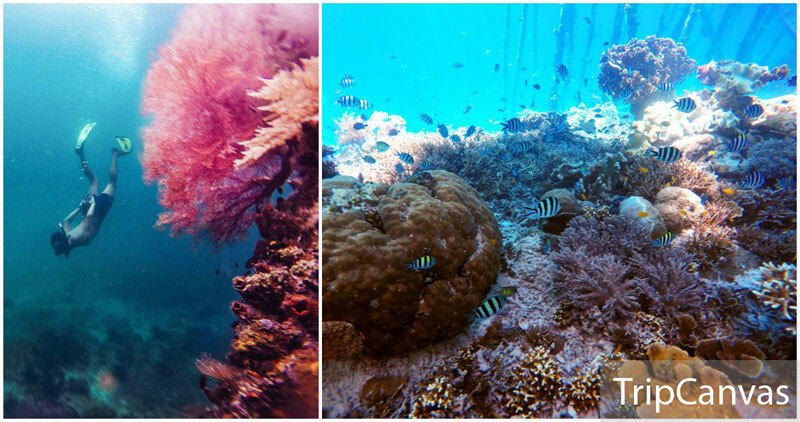 As the colourful reefs of Yenbuba, Friwen Wall and many more shimmer through your goggles, you’ll know why they call Raja Ampat an underwater paradise. Discover the underwater marine life from manta rays, brightly coloured fish, lazy turtles and view the rarest of corals while enjoying one of the best water activities in Raja Ampat. 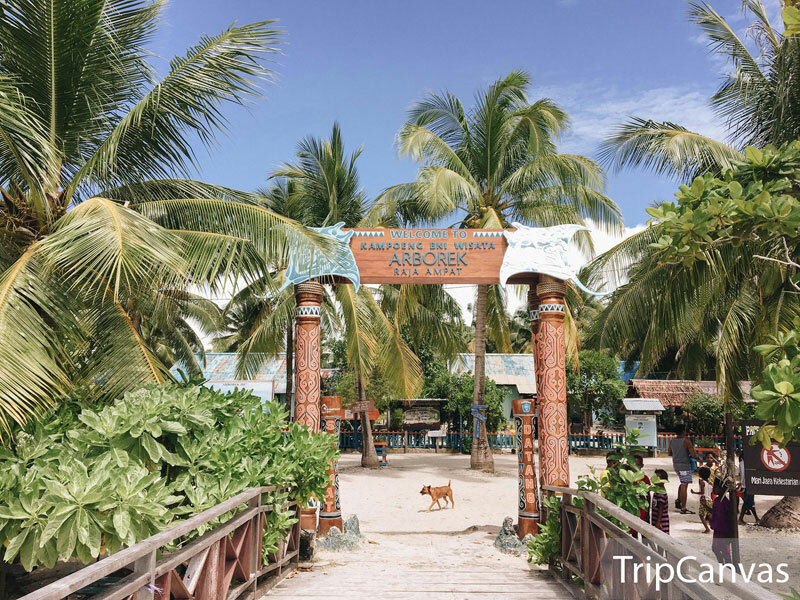 In addition to the house reefs, do spend time snorkeling around the local village piers such as Arborek and Sawandarek – within a smaller area, you’ll be able to catch sight of the vibrant marine life! You can find the best diving spots here in Raja Ampat. Having topped the World’s Best Diving Destination 2017 by UK based Dive Magazine, Raja Ampat has three-quarters of the world’s coral varieties, 10 times that of the Caribbean! 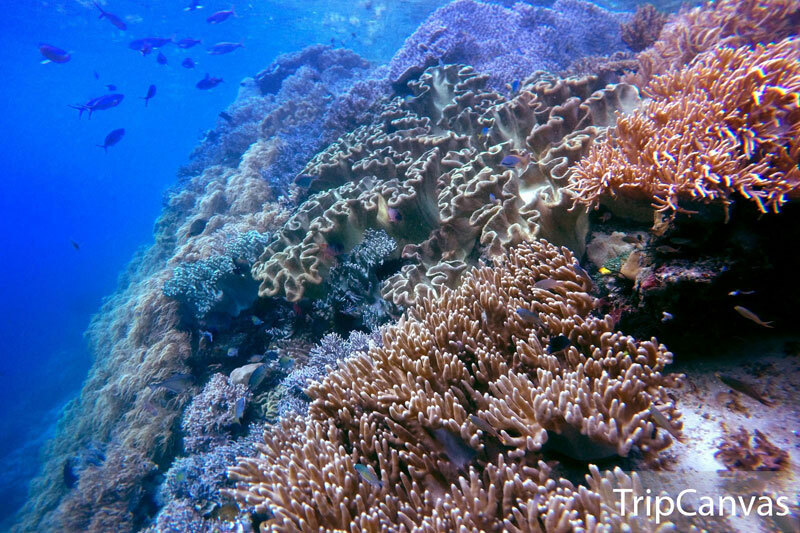 A heaven for underwater photography with magnificent hard and soft coral, clear water and a teeming reef life, there are many species here you won’t find anywhere else. From small colourful creatures like pygmy seahorses to big fish action such as the Giant Trevally or the Dogtooth Tuna can be found here. You can spot many sharks too, mainly Blacktip and Whitetip reef sharks, Wobbegong sharks, as well as Manta Rays. Some of the most popular dive sites in Raja Ampat are Melissa’s Garden, Black Rock, Friwen Wall, Kaleidoscope, Neptune’s Fans, Kri Island, Mansuar Island, Chicken Reef, and Three Sisters. Editor’s Note: All Raja Ampat homestays or resorts that offer diving can arrange dives at these dive sites, but please be aware that some of the sites experience strong currents and require advanced diving certification and experience. 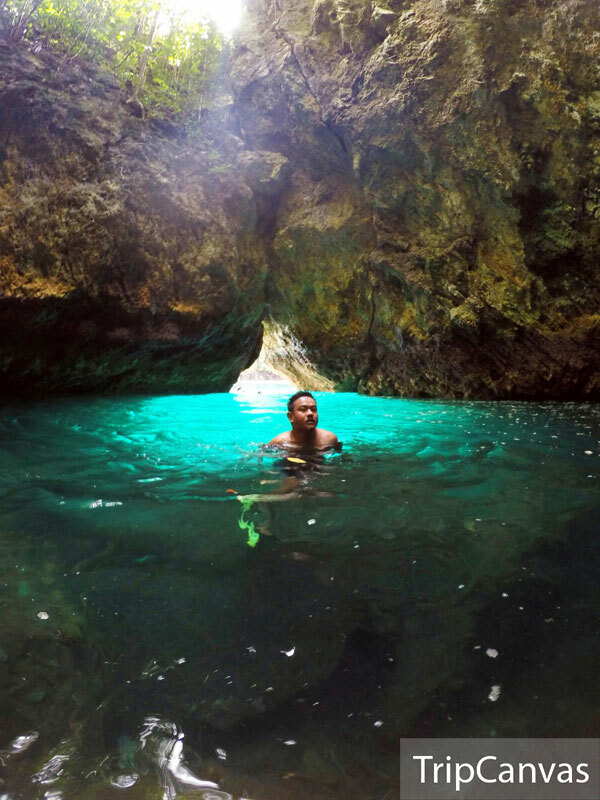 Situated in Kabui Passage, between the islands of Waigeo and Gam, and under the cliff of the coral island, you will find a unique underwater cave full of stalactites and stalagmites. 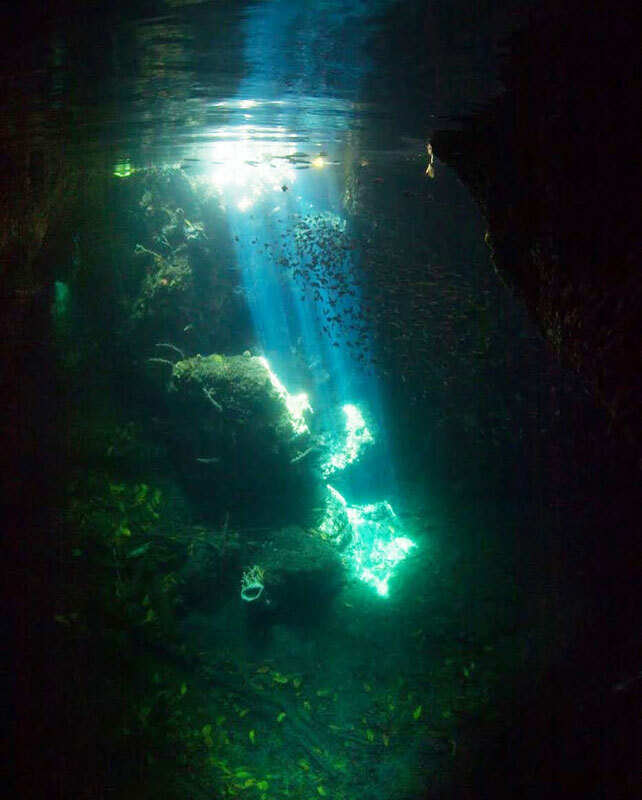 The Blue Water Cave reflects the vibrating and striking blue of the water, which at the same time captures and reflects the shine of the sky reflected on its surface, creating an almost magical atmosphere. 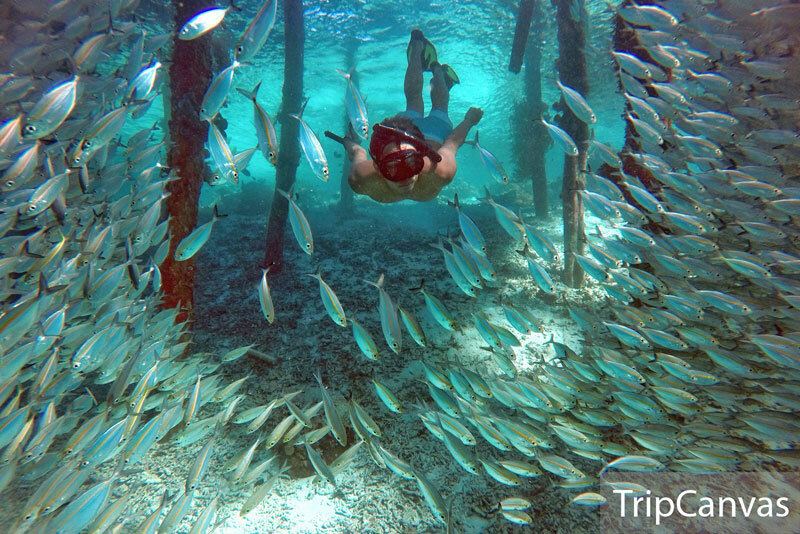 Getting into the water to experience it is really a once-in-a-lifetime unforgettable experience. Tip: To enter the cave, you need to wait for low tide, because when the tide is high, the tiny crack of the entrance will be submerged in water. As the currents can be strong in the passage, you need to be aware of the cliff walls and rocks formations up ahead. Location: Kabui Passage, Kabui Bay, Gam Island, Raja Ampat, West Papua, Indonesia. Coordinates here. What better way to plunge into the sea than by rope swing? This rope swing makes amazing pictures for anyone brave enough to conquer it. 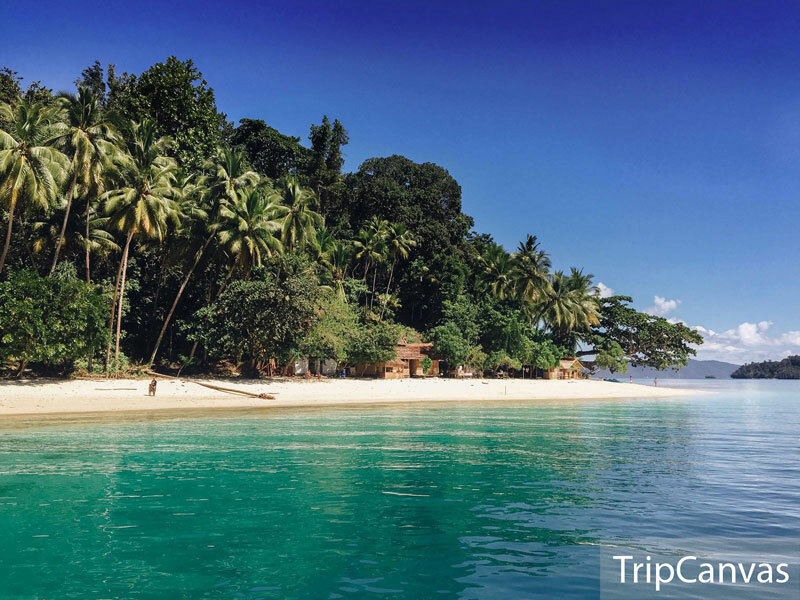 Known as a popular diving destination, Friwen Island has a stunning view with coconut trees, white sand beach, and several huge trees that provide shade on a hot sunny day. And guess what’s hanging on those big trees? Yes – rope swings! This rope swing is easy to handle and is a favourite for local kids and adults alike. In fact, it’s a fun way to plunge into the water. Don’t quite have the courage? You can simply relax on the beach while enjoying some drinks and snacks in the local warungs. Location: South Waigeo, Raja Ampat Regency, West Papua, Indonesia. Coordinates here. The people in Sawinggrai Village are known for their hospitality. But what you probably didn’t know is that they are actually not the most famous locals of Sawinggrai. 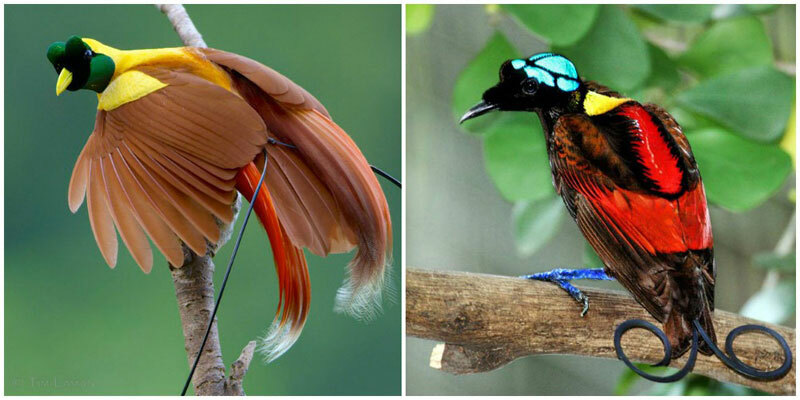 Come, meet the mascot of Papua – the beautiful Cendrawasih bird which is also known as the Bird of Paradise. There are four species of Cendrawasih reared in this village, namely the Red Bird of Paradise (the icon of Sawinggrai), the Wilson’s Bird of Paradise, the Lesser Bird of Paradise, and the Greater Bird of Paradise. The best place to watch them dance in their natural habitat is a location that requires a 30-minute climb up Manjai Hill, which is just behind the village. It’s better to set off early in the morning, though it’s not a guarantee that you would catch sight of the birds (their appearances are quite random). 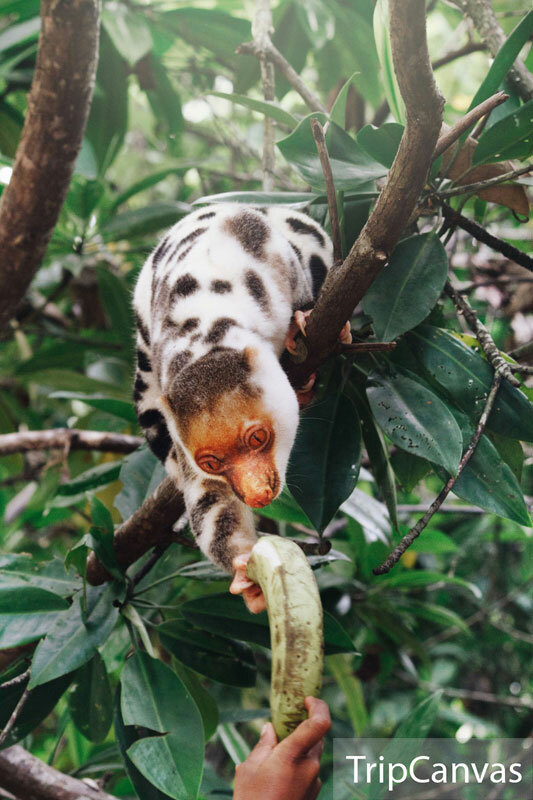 Another endemic animal that can be found in this village is a species of marsupial, the uber cute Black-spotted Waigeo Cuscus. 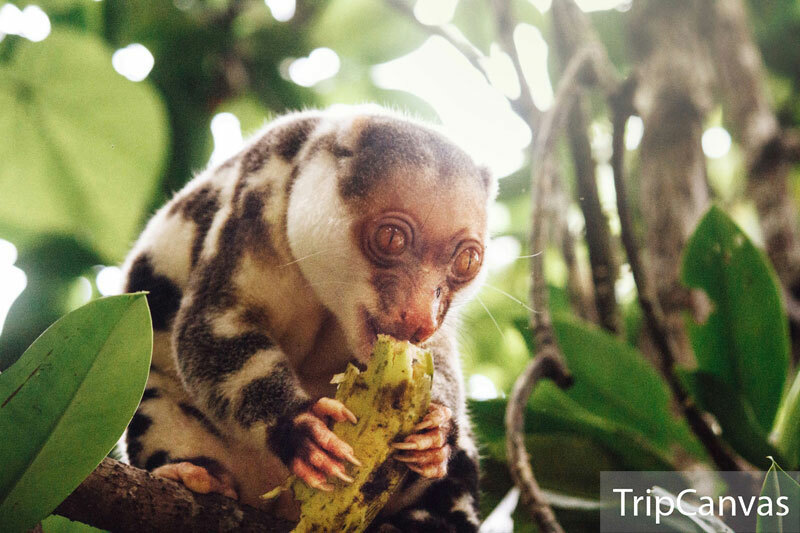 Unlike the Birds of Paradise, it is easier to meet the cuscus as they are living in the trees near the local homes. Our advice: You can lure them with bananas! Getting there: From Waisai, you can continue your journey by longboat to Sawinggrai. To reach the Cenderawasih observation site, you must climb up Manjai Hill behind the village for about 30 minutes. To reach the cultured fish-feeding site, you need to walk only about 100 metres to the pier. Coordinates here. Now that you know where to go, it’s time to decide on your homestay or resort! 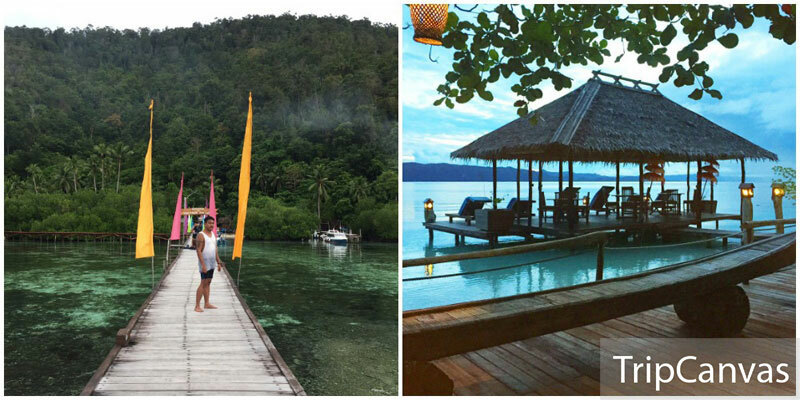 Raja Ampat has several properties that cater to both luxury and budget travellers that offer great hospitality, feature recreational facilities and ensure that guests have a hassle-free stay. If you are expecting a resort with air-conditioning, hot water, etc., you need to go elsewhere. What you’ll get here is an amazing opportunity to stay so close to nature with the powder-soft white sand private beach that lies at the mouth of a jungled limestone gorge, schools of fish swimming on the shore, and clear turquoise water. 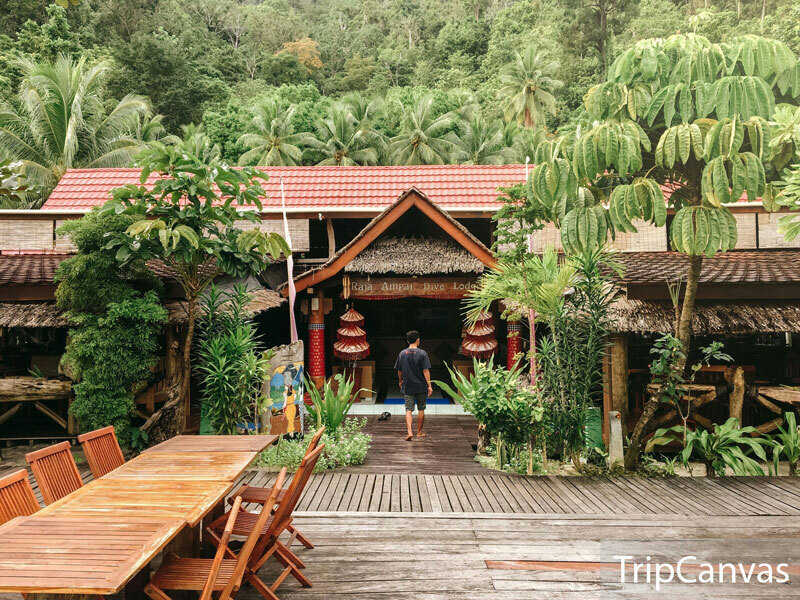 Located on the southern coast of Waigeo, this homestay has four private thatched roof stilt bungalows that can sleep two in each, and a dormitory-style bungalow that can accommodate up to 10 people. If you’re in the mood to relax, there’s also a large wooden recliner on the deck at the end of Yengkawe’s jetty. It’s the perfect place to simply sit and gaze at the ever changing vistas across Kabui Bay, or to use as a base for snorkelling in the waters around your bungalow. Getting there: From Wasai, you can take the speedboat, which costs IDR 300,000 (USD 22.50) for one way. 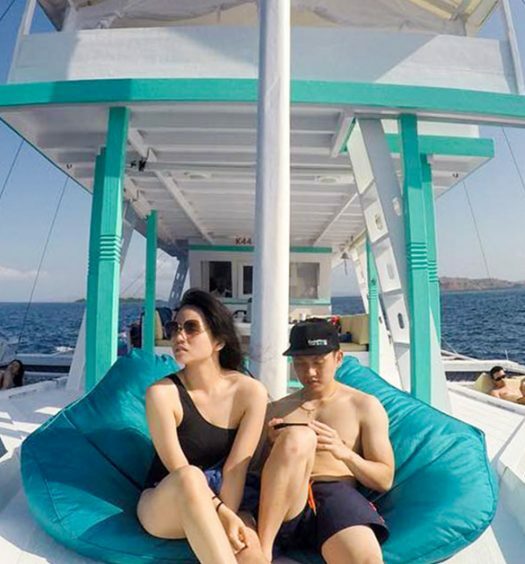 The boat can carry up to 10 people and trip cost is shared by passengers. 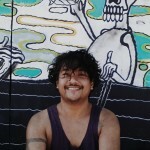 Papuarts Alter-Native Stay is the place to be when it’s time for a break. Located away from traffic, every kind of trouble and noisy places, what you will get here is only the serenity provided by pure nature all around. The rooms are simple, cosy and clean, and natural materials are used throughout the property. But the real wow factor comes from the surrounding jungle and sea. The place is relatively easily accessible from Waisai harbour and Waisai airport, and there is a village nearby so you’ll really feel like you are really living amongst the locals! When you arrive at this secluded island, you will be greeted at the jetty by all the friendly waving staff of the resort. 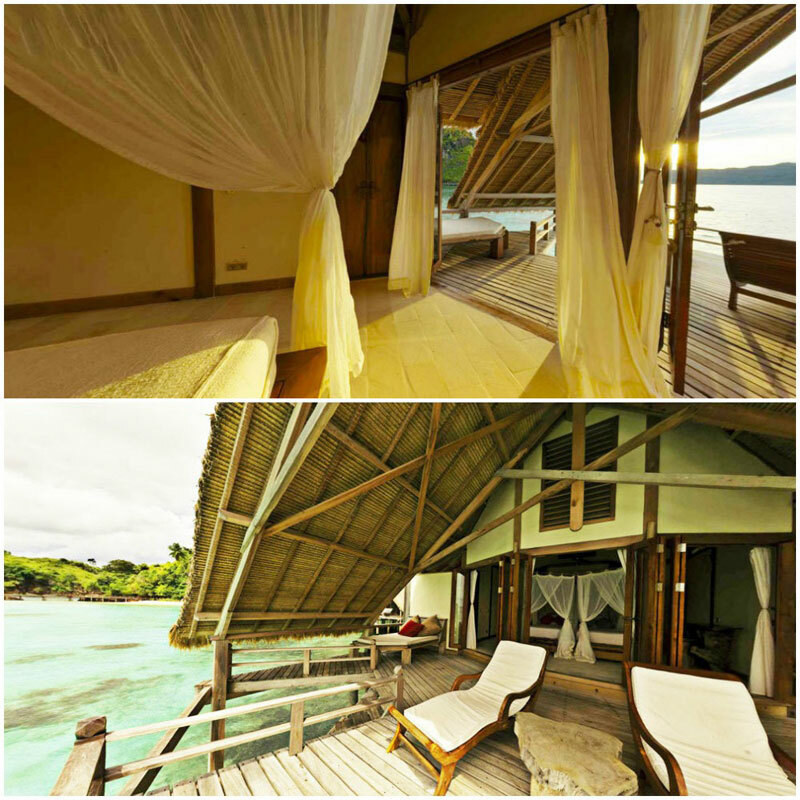 Here, you will experience Raja Ampat’s hospitality. 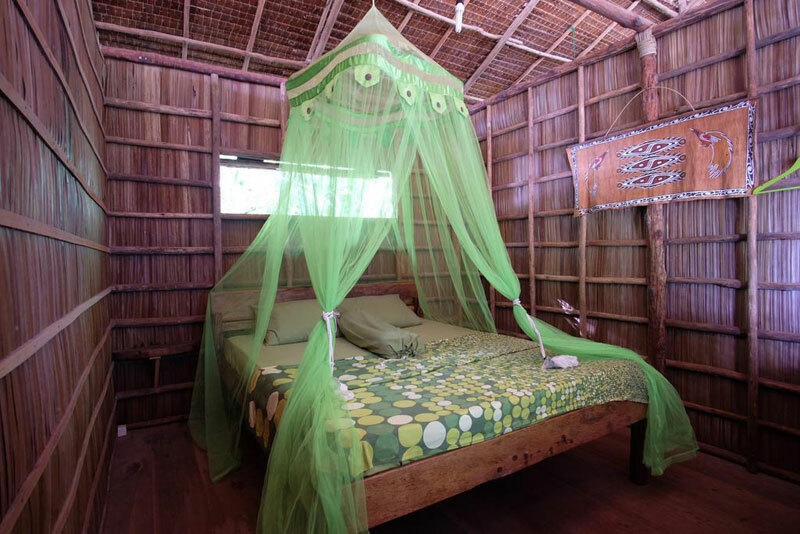 Misool Eco Resort is strictly environmentally aware and built with sustainability in mind (it has done tremendous work to preserve the manta rays, sharks and other marine life of Raja Ampat). You will find yourselves in overwater cottages and villas that have been built on-site from locally salvaged wood. Adding to each cottage’s allure are thatched roofs in outdoor seating areas where you can easily slip into the sea for an afternoon snorkel or swim. In addition to beautiful private rooms, guests will also find a restaurant and a spa. 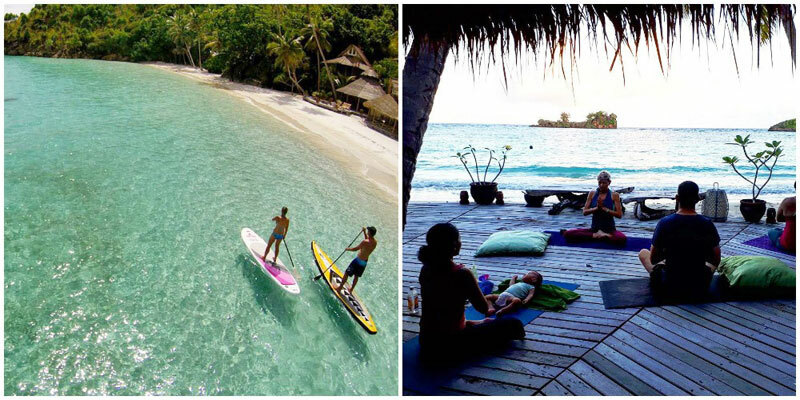 Scuba diving, snorkelling, paddleboarding and yoga are also available for all guests staying at the resort. 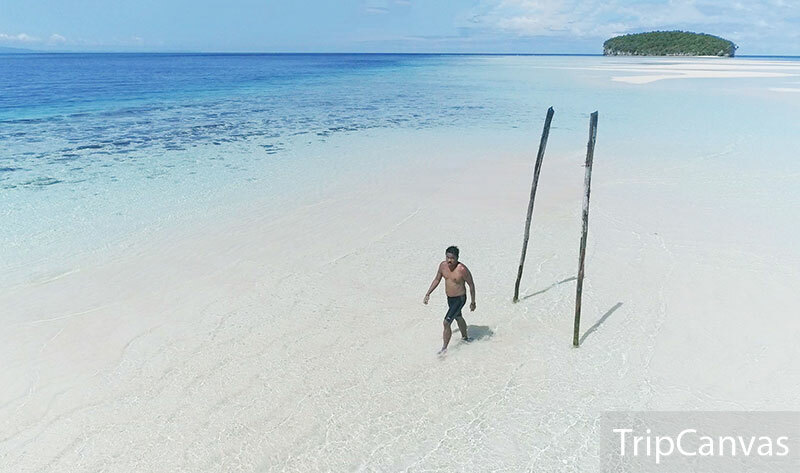 Rates: Starting from USD 2,400 per 7+1 nights (Water Cottages & South Beach Villas), including 4 meals per day and Sorong Airport pick-up and porter service. Fronted by a white sand beach and backed by the lush Papuan rainforest, this dive lodge is surrounded by natural beauty. Not only does it provide you with luxury accommodation, diving and snorkelling gear, Raja Ampat Dive Lodge is also home to many birds and rich marine life. You can even spot walking sharks in the evening or exotic birds in the mornings. The bungalows are located by the water, are spacious and airy, well furnished, air-conditioned, and are very clean with large bathrooms. There are also standard rooms for more frugal travellers. beautiful beach during which you can eat your packaged snacks. Still can’t get enough of the water? You can request for an afternoon dive and a night dive too. If you’re not into diving and snorkelling (really??? 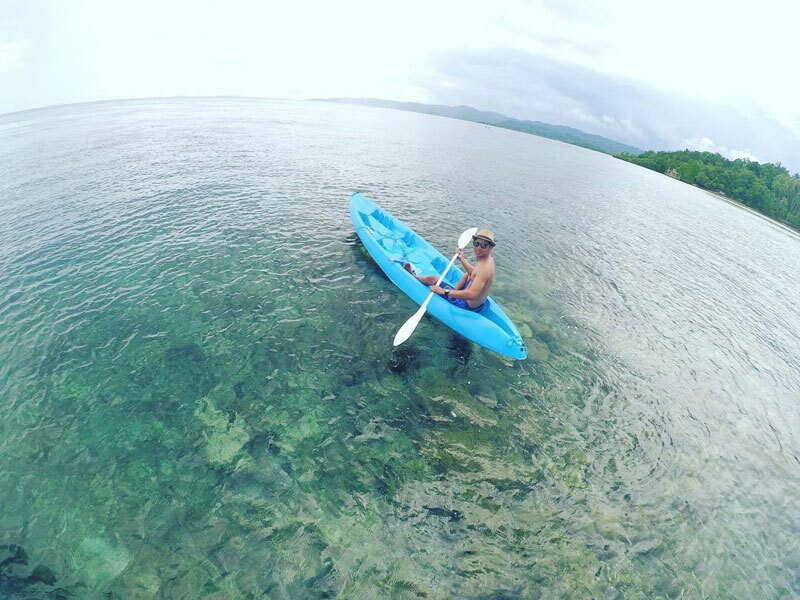 ), you can also rent their kayak or canoe for free. So let’s see what we have here. Sun = check. White sandy beach = check. Crystal clear water = check. Jaw-dropping landscape = check. Exotic native animals = check. Rugged wilderness = check. Friendly local tribes = check. Unique local food = check. Exciting and thrilling water activities = check.